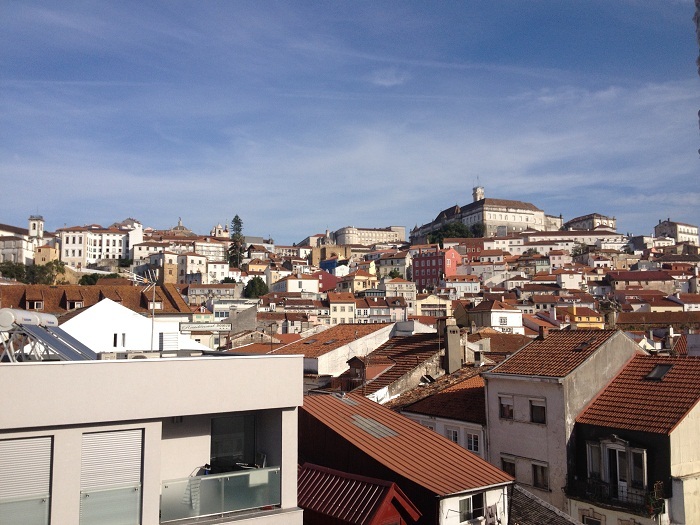 It’s Friday morning and it’s a beautiful day here in Porto. We will be here for a few more days and are really enjoying our time in this historic city. 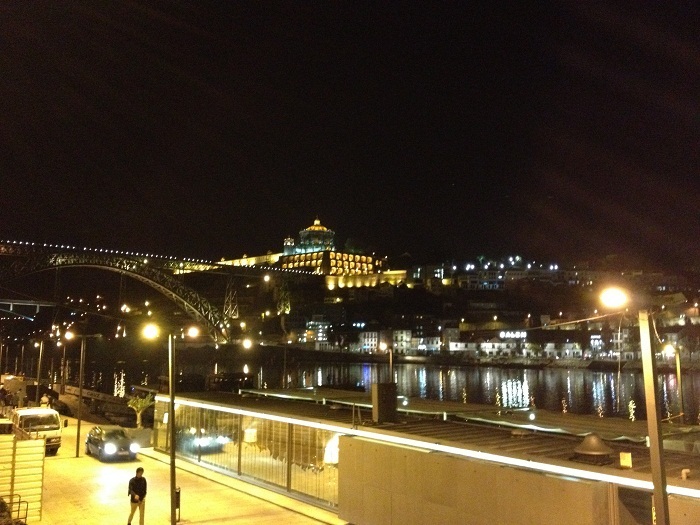 One of teh best parts of our visit is seeing the Douro river that runs through the city. 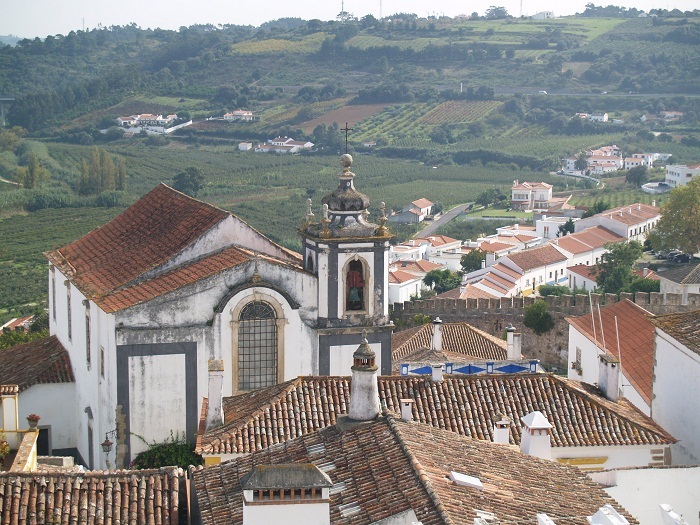 This city is also the home of port wine and it’s the only place in the world that wine of this name comes from. And there’s more. 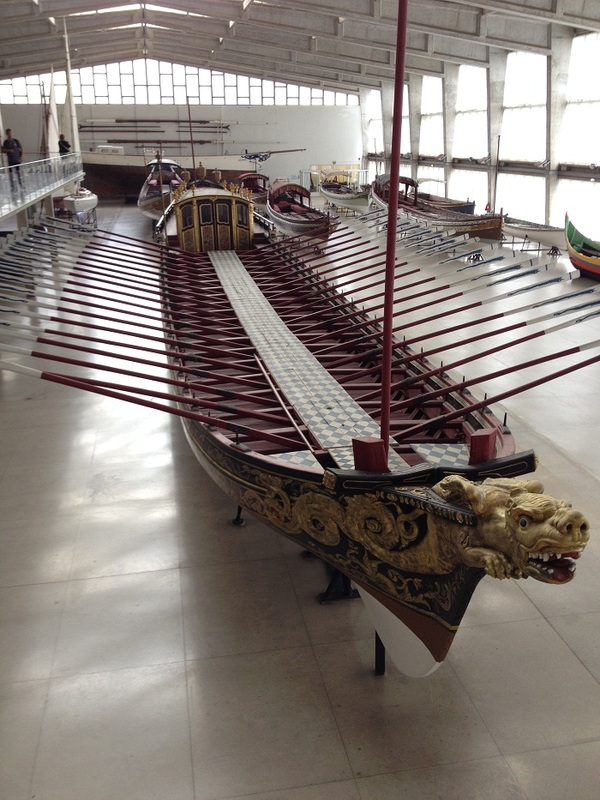 As an added benefit of visiting the city, I get to do a real boating related post, finally, as the river is the home to a unique style of traditional sailing craft. These boats were used for many years to transport wine in casks down the river from the wine country that is upstream from the city. 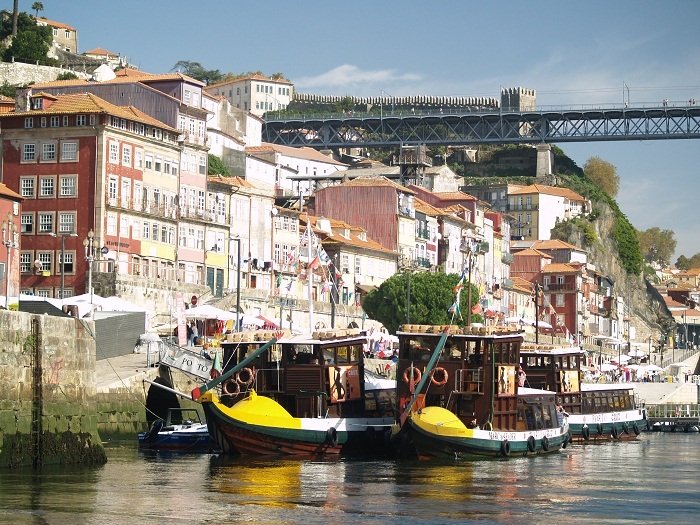 Port is a fortified wine that is made from either white or red wine that is made elsewhere and then brought to Porto where it is mixed with additional alcohol and aged a minimum of three years and often much longer to make the well known wine. This is a good link to learn more about this type of wine. While the wine is brought to the city via truck these days, the city still has a tradition of maintaining the historic boats that used to transport it from up river. And, it seems that they are still building a few new ones. 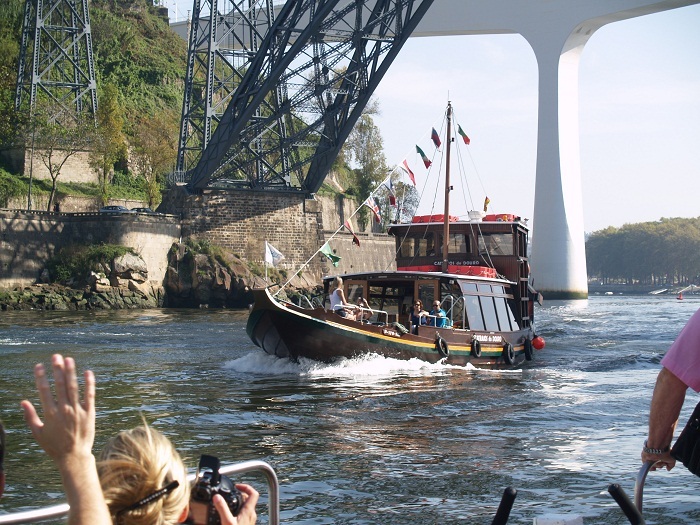 And, the tour boats that are used today on the river are still built out of wood although they are now powered by engines. We really enjoyed our short cruise on one these nice boats. The style is unique to the region with a high bow and stern, designed to manage the rapids in the river north of the city. The current really rips when the tide is ebbing. The force of the current is impressive. 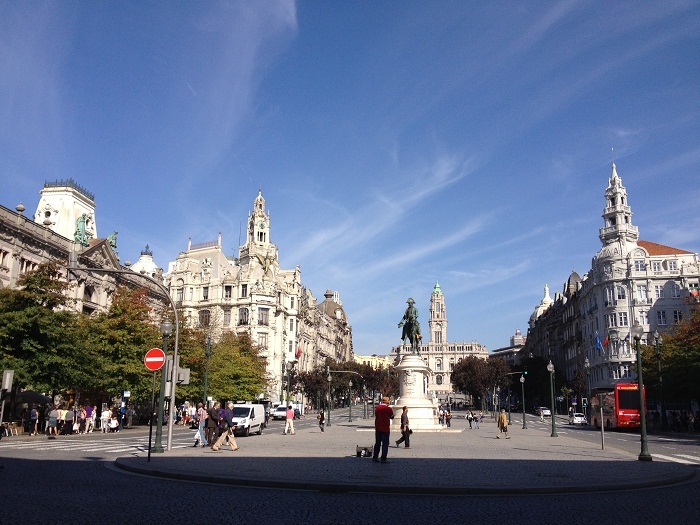 Our hotel is a short distance from the river just off of a really impressive city square. I guess that you could call this the “modern” section of the city. As you go down to the river, you are in the really old section where the port wine business are located, even to this day. The sides of the river are very steep and there are a number of really impressive bridges. In particular, this one was designed by Eiffel of Eiffel Tower fame. It’s beautiful and has a pedestrian walkway on it’s top. 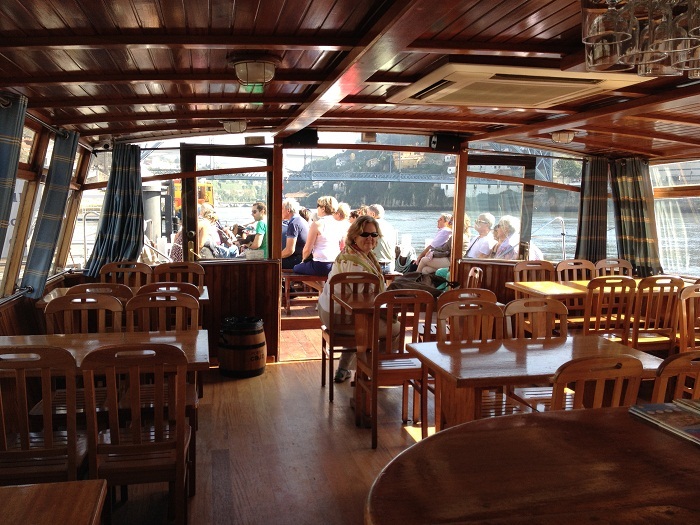 The boat that we boarded for the river tour looked like this one. It was constructed locally out of wood. I like the design and was impressed with the speed it could make against the current that was ebbing at close to 5kts. Unlike so many tourist boats you see in historic areas that only barely resemble their traditional counterparts, these are very nice and there is a high attention to detail in their construction. The interior was quite well appointed. Brenda and I were the only ones on board that seemed to appreciate the need to stay out of the sun. I guess it’s from our years aboard, always trying to avoid getting a “good tan”. We went under a number of great bridges but the Eiffel was clearly the most impressive. 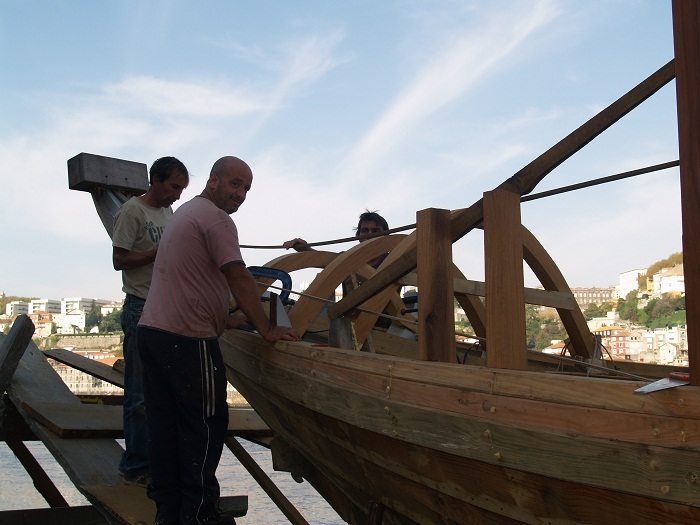 There is a boatyard perched on the bank of the river, right in the heart of the city where they are building and repairing traditional boats. 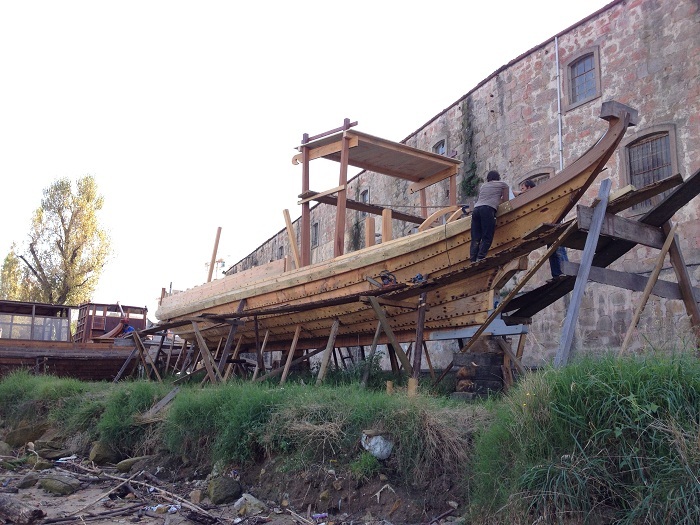 There were several traditional boats under construction and a big tour boat being made as well. Quite a bit of activity. Notice the chain saw near the guy on the scaffolding. The builders are clearly all about efficiency and using the best tools for the job. 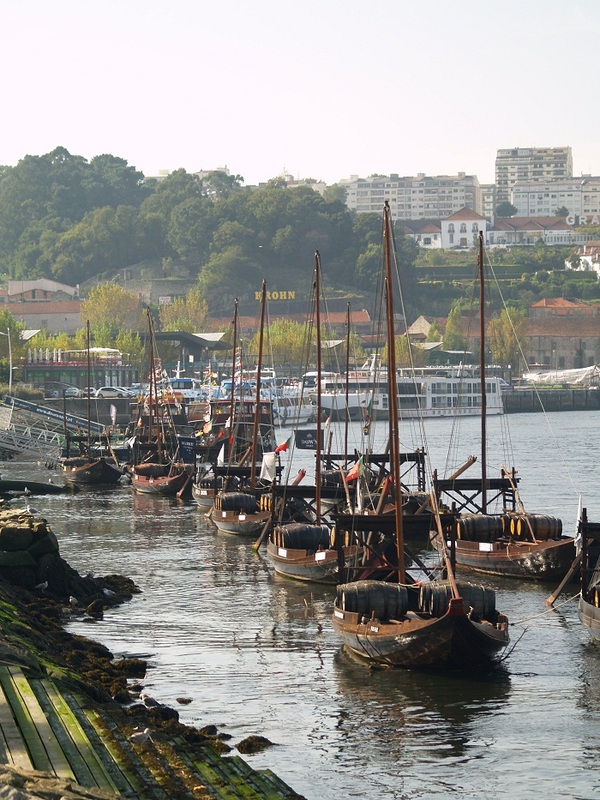 The port wine companies are thriving and each “house” underwrites a traditional craft that’s moored on the river and flies their banner. It’s impressive to see them lining the waterfront. They appear to be in excellent condition. 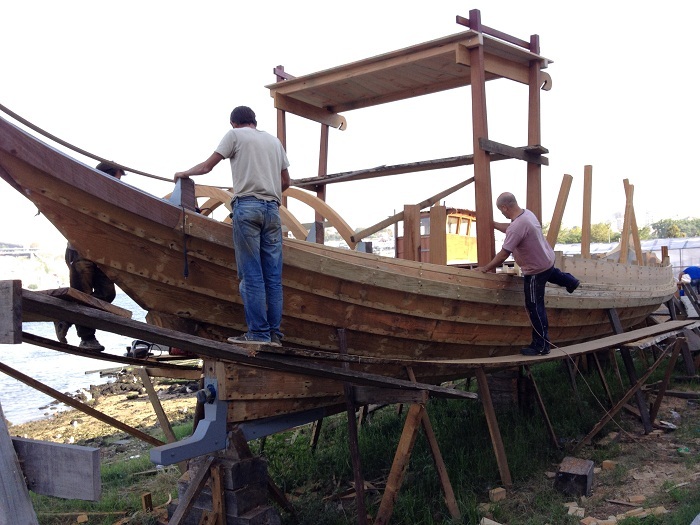 It’s good to see a thriving classic wooden boat tradition living today. I found this wonderful video of the Douro wine boats making their way down the river back in the 20s. It’s very well done. Check it out. Amazingly, the video only has a few hundred views. 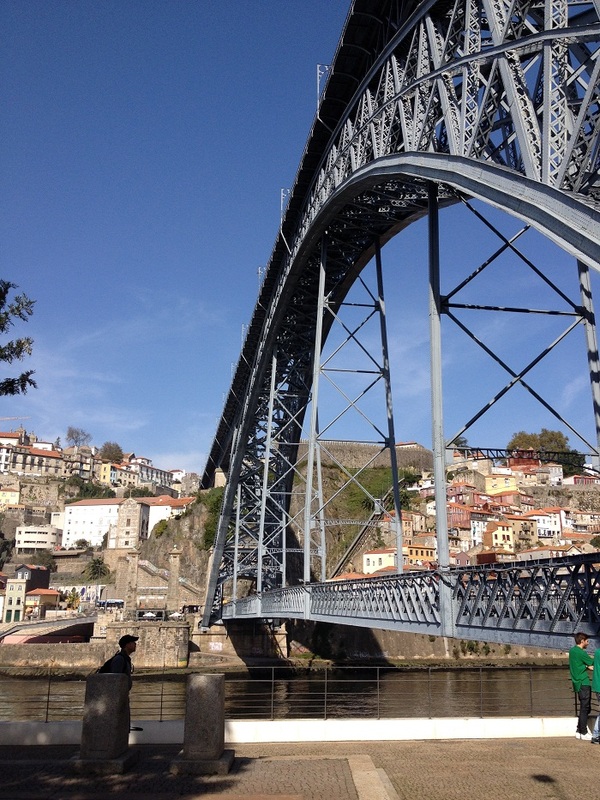 It’s Thursday morning and we are now in Porto, having arrived yesterday after a few hour drive north. Speaking of roads, it’s amazing to see how much money they have spent on roads here and it seems to me that on a per resident basis, Portugal might have more roads than anywhere I have ever been. It’s just not that big of a country and there are roads heading everywhere. When I asked a resident what they thought had contributed most to the out of control national debt for the country, his immediate reaction was “highways”. He told me that the government had made many new highways over the last few years that were way beyond what was needed. I agree, the roads are terrific. The other reason that he felt that the debt had gotten out of control was because they had built many stadiums for their hosting of the World Cup soccer a few years ago. He said that they had built a dozen or more and most, if not all, are now sitting empty. 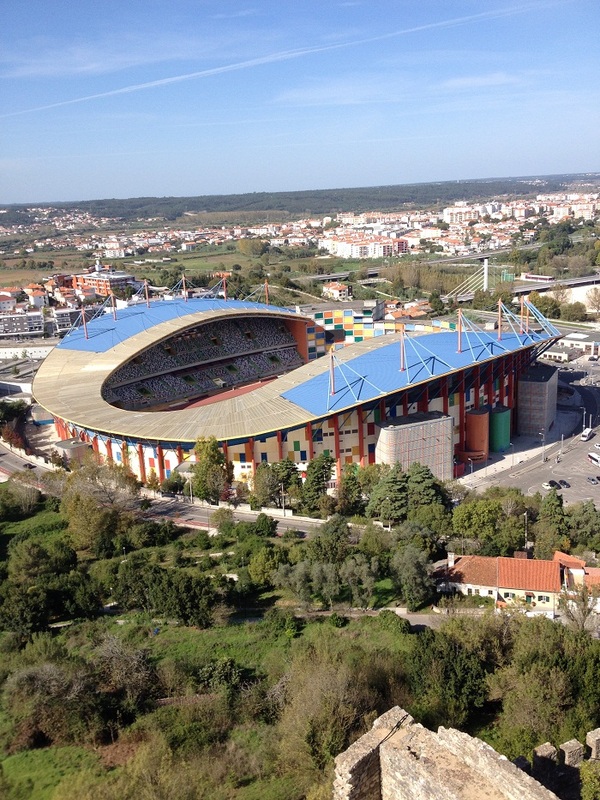 We saw one of these beautiful stadiums on our trip and it was indeed a grand building with lots of nearby housing that also looked vacant. I guess it’s pretty easy to get carried away with national pride and loose sight of what it’s going to cost in the long run. Nice stadium. Bummer it’s not in use these days beyond a display for a local car dealer. 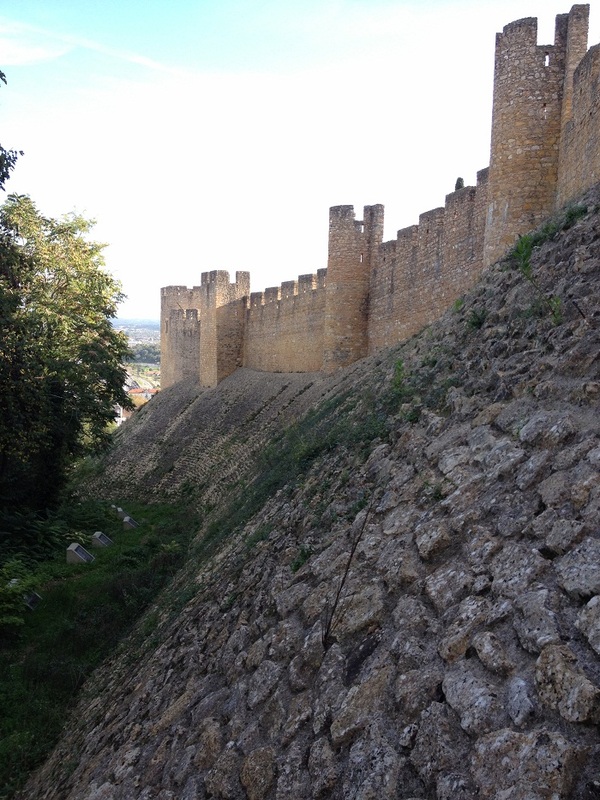 In case you are wondering, I took that photo while standing on the wall of this castle. I’d say that’s about as much of a contrast as is possible. 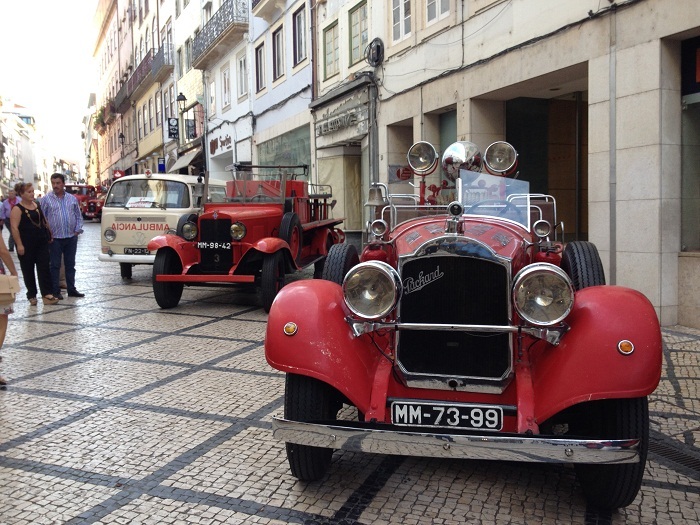 In many ways, Portugal is a good example of contrast; the contrast of old and new. So, speaking of old, we are now in Porto, the home of Port wine which we plan on trying a bit of while we are here for a few days. Today we will be touring the old part of the city on foot which should be fun. I expect that it’s built on a hill as it seems that most everywhere we go involves a hill. Always up both ways, it seems. 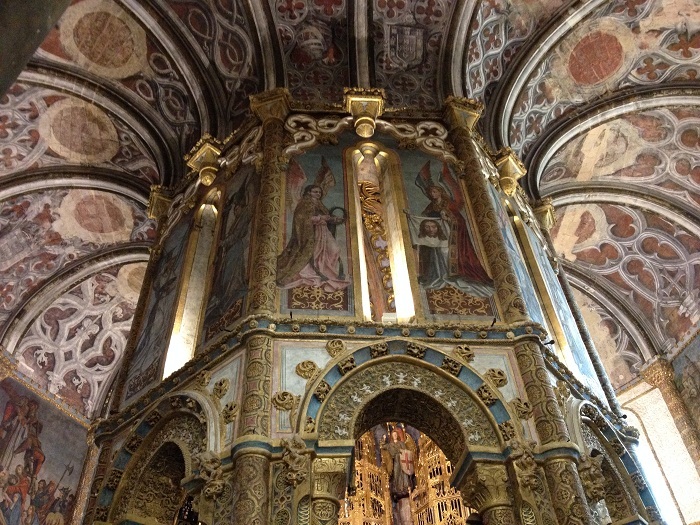 I should include a few more photos of our time in Coimbra. While we were there, we headed up to the highest point in the city and enjoyed this beautiful panoramic view of the surrounding area. Click on it and it will go full screen, I think. Very scenic, if a bit vertigo inducing. 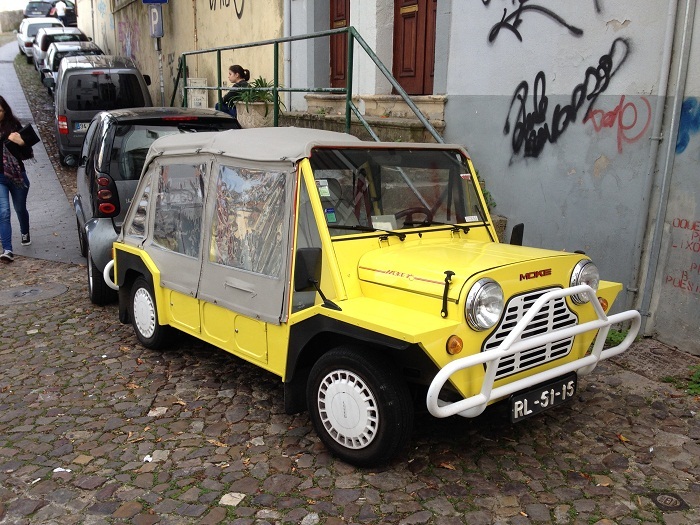 We loved this Mini Moka car. It’s a car that only a golf cart could truly love. Looks like something out of a cartoon. 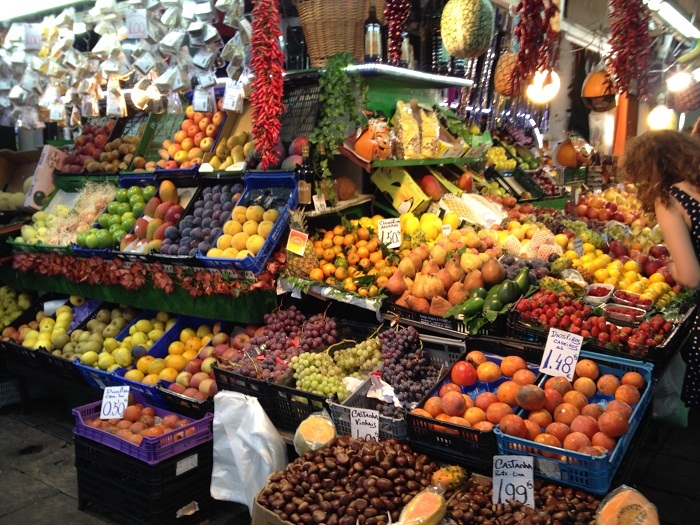 And, of course, always food on display in the markets to make you think of your next meal. 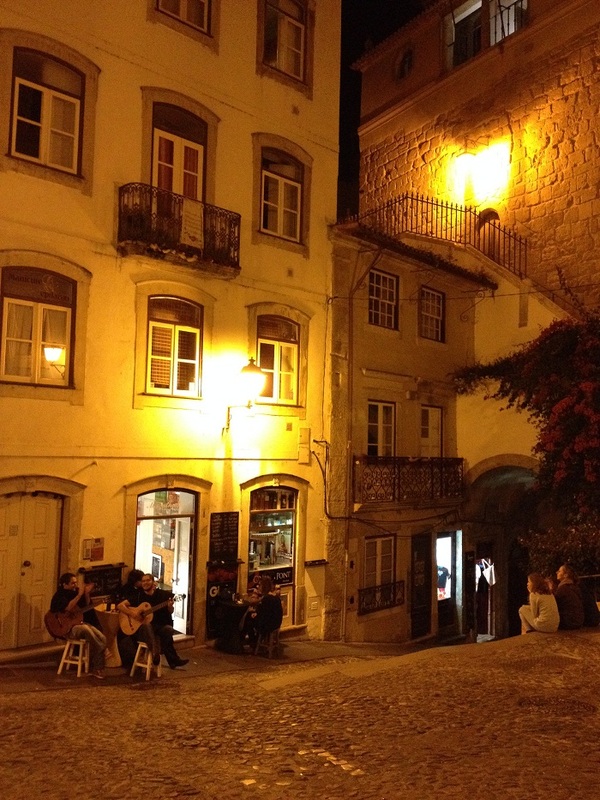 On our last night there we enjoyed a walk in the city after dark and happened upon a group of young singers who were camped out at a little bar on a back street in the historic area. They were students at the university, the oldest in Europe, BTW. Note that they are wearing black capes, a tradition at the university. It was a bit chilly and they had wrapped them around themselves giving them a somewhat medieval look. 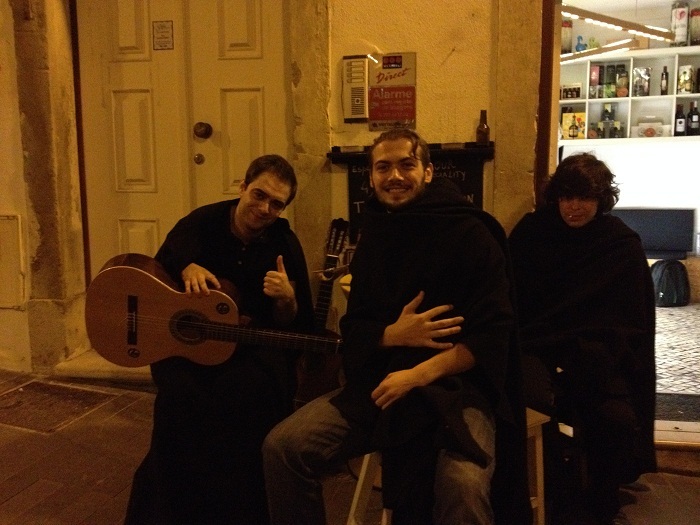 Their impromptu “concert” of traditional Portuguese ballads was perhaps designed to get free beer, which they did. We loved it and sat across the street at a bar and had a glass of wine, listening to them play for an hour. It was a magical scene. What a wonderful and completely non-commercial experience that topped off our visit. How serene. A nice trio of young men. The one in the center was particularly engaging and charming. However, I am not sure I’d want him dating my daughter, if I had one. He looked like a bit of a scoundrel, in a nice way. I guess that only added to the magic of the moment. The rest of the city looked lovely in the twilight. Off to simple dinner. 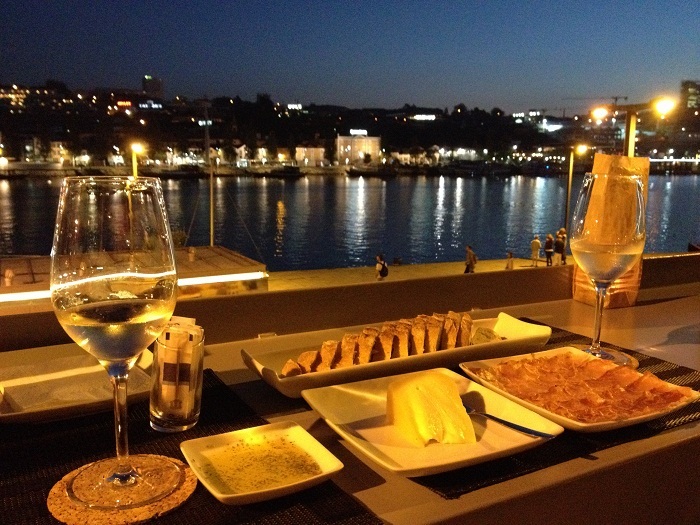 And, all this with a 6.5 Euro bottle of nice red wine. Can’t beat it. We have eaten a LOT of tomatoes on this trip. They are, unlike in the US, as good as they look. All this is making me hungry. Perhaps I’d better head off to breakfast. It’s Tuesday morning here in Portugal and it’s a special day as it was 42 years ago today that Brenda and I had our first date. As we enter the second half of our month long trip to Portugal, we are certainly in more interesting surroundings than that day back in 1972 when we went to a tropical fish show in Norwalk CT. Yes, a “tropical fish show”… Only the best for Brenda back then as well as today. Well, perhaps there has been somewhat of an upgrade during that time. We are after all, in Portugal. No, hold on for a minute, let me think… Was October 28 our first date or was it when I asked her to “go steady” while we went on a long walk in the woods while I tried to summoned up the nerve to ask her if she “liked” me. Hmm… Is this the beginning of dementia settling in? One thing I do recall clearly from our walk in “Devils Den” in Weston CT, way back then was that her dad freaked out after his oldest was AWOL in the woods with some blond guy with shaggy hair, in the rain, for hours. I am afraid that he never really got over that one. One way or the other, October 28th continues to be a day we celebrate each year and so far, Brenda seems as tolerant today as she has been for the last 42 years. Well, to be completely truthful, she’s been tolerant most of the time but I won’t fault her for her occasional lapses. Fingers crossed that it will continue. Wish me continued good luck. 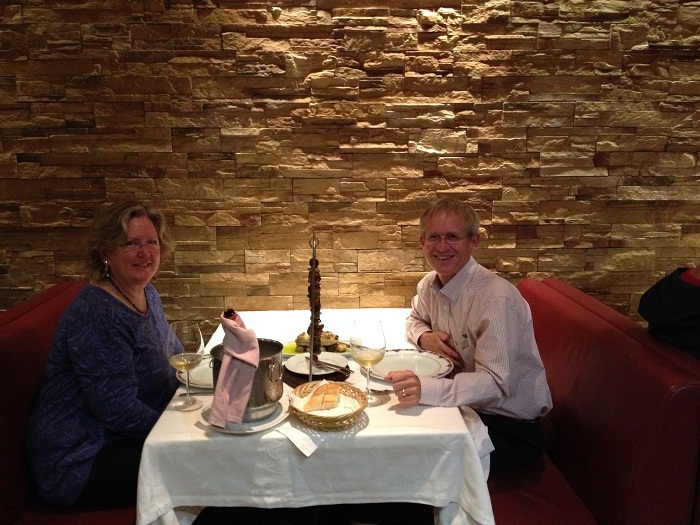 Alas, no pictures from way back then with us here in Portugal so you will have to settle for one taken at dinner the other night. Doesn’t low lighting do wonders for us? I expect that the “old time” photos would have been, well, younger. Another thing that’s different now is that the wine flows more freely even though the drinking age moved up from 18 to 21. 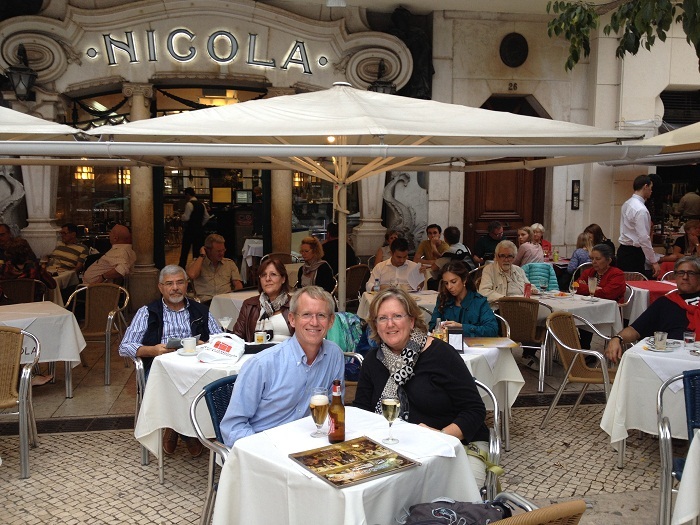 No wait, the drinking age in Portugal is 16. Hmm… That doesn’t help much does it now that we are in our “upper mid 50s”? However, it would have back then as 16 was Brenda’s magic age. Good thing I was only 17 myself or the whole thing would have been illegal. Time flies, doesn’t it? I guess I had better get going and wrap this post up. We have more memories to make and the day is wasting. 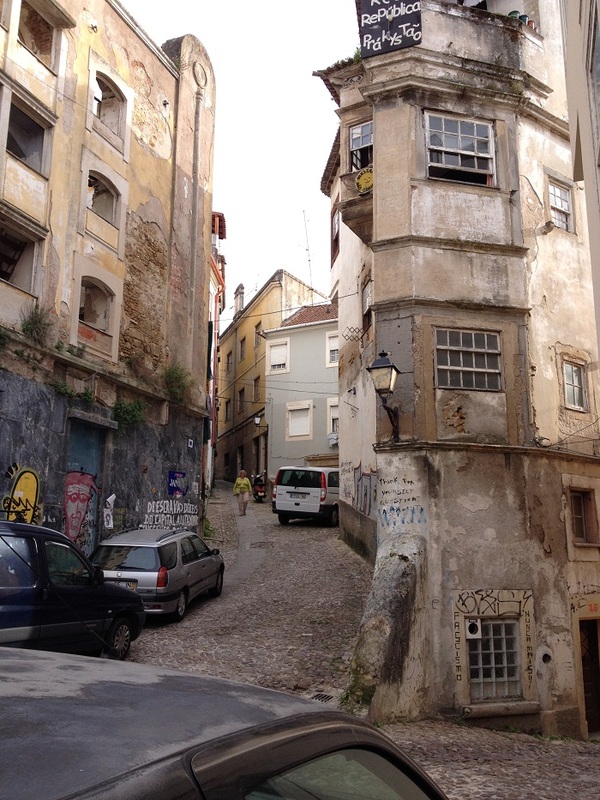 Discovering Coimbra and more hills to climb. It’s Monday afternoon and we have just returned from wondering around this wonderful little city. The hotel where we are staying is located just on the outskirts of the old part of the city. Interestingly, this is the home of the oldest university in Europe. I expect that we will tour the campus tomorrow. For now, I’d like to share a few photos of this picturesque city. First, here’s a shot of the view from our hotel window. Pretty nice if you ask me, even if you didn’t. 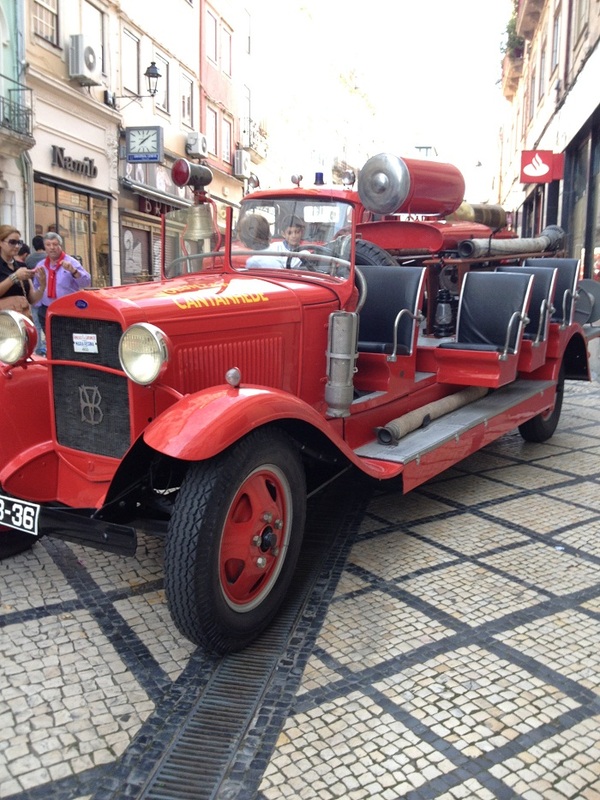 Yesterday there was a display of antique fire engines along the main street in the shopping area. I was struck by the brands on these trucks. 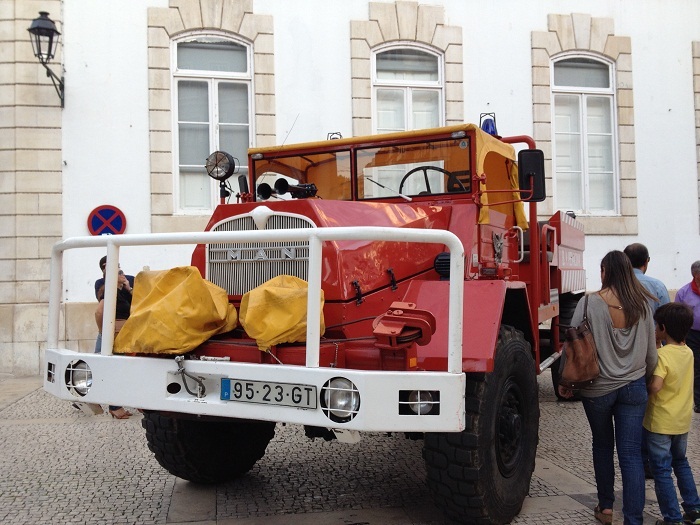 I have never seen fire engines from these companies in US car shows. Interestingly, all of the vehicles were open and folks didn’t seem at all bashful about climbing up and sitting in the drivers seat. In the US, that just isn’t done. Don’t touch! I loved this Packard. I didn’t know that they made fire engines. Actually, they probably didn’t and just sold the chassis to someone who made it into a fire engine. How about a Ford? Or, a MAN. 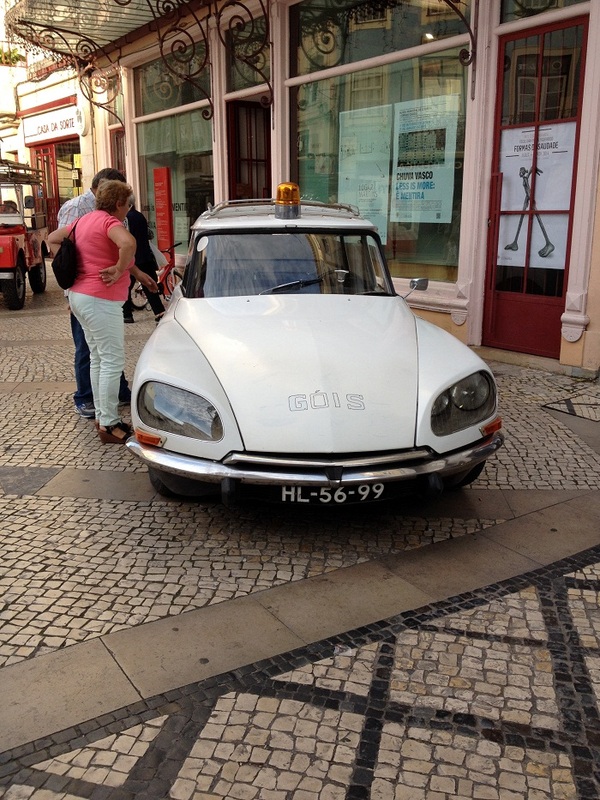 With the exception of one VW bus, the only vehicle in the group that wasn’t from the US was this Citroen. I guess it was an ambulance. I was particularly amused by this police car. I can’t imagine any self respecting cop in the US giving up his Crown Vic for one of these. How would it look for one of them to get into a high speed chase with a souped up muscle car in one of these? “He copper, want a drag? Eat this…” However, perhaps the bad guys would have to give up as the’d likely wet themselves when they looked in the rear view mirror. As in other cities that we have visited so far, the streets here are impossibly narrow. I don’t think that our hulking SUVs would work well here. 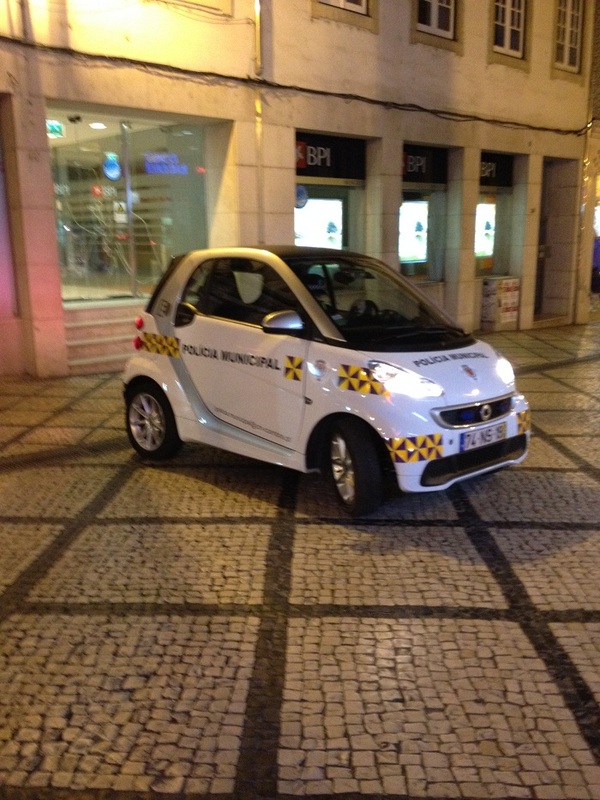 Perhaps US drivers could learn a thing or two from the Portuguese about proper cars. 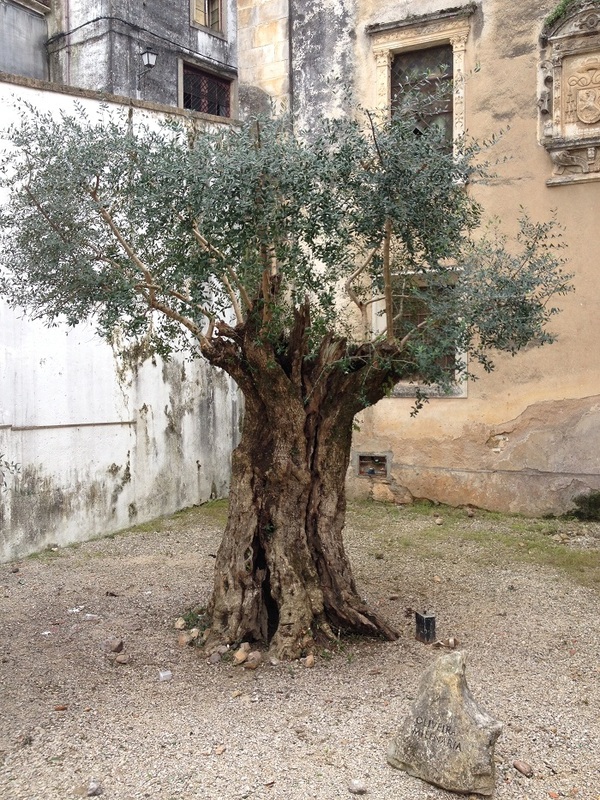 I was struck by this remarkable olive tree out behind a church. I suspect that it’s age can be counted in thousands of years. Well, that’s what the plaque near it seemed to suggest. The food here is really amazing with bread everywhere that you just can’t find in the US except where it is sold as “artisanal” bread for $5.00 a loaf. 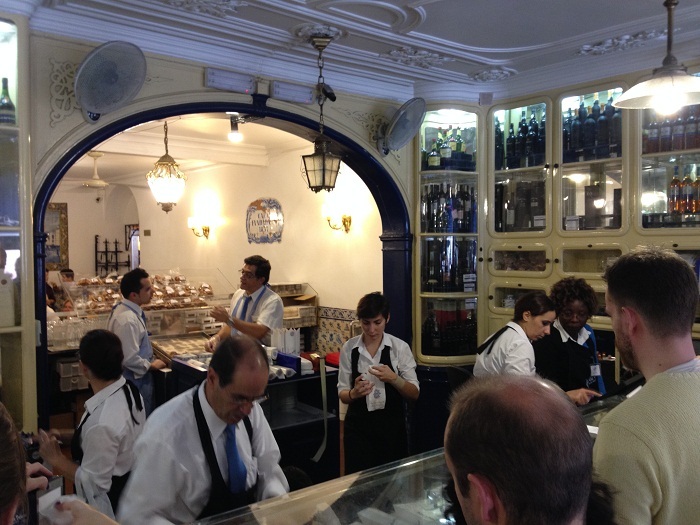 Here, the best bread ever is just well, everywhere and it’s less than one Euro a loaf. Pastries appealing to you? Yes, this is the place. All along the narrow alleys you can see picturesque shops selling all sorts of goods. When we visited this shop to buy a bottle of wine for about 3.5 Euros, the shop keeper tried his best to tell us how terrific our choice was as it was one of the most expensive bottles of wine he had in the store. 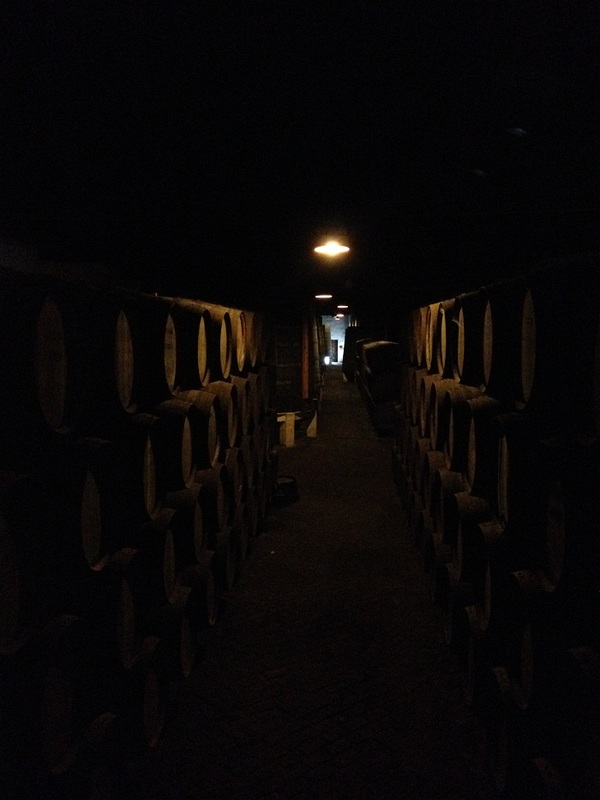 However, some of the bottles of port were a lot more as some were from the 1930s. Everything looked so terrific. I wanted to buy one of everything. This was an interesting shop selling local pottery. 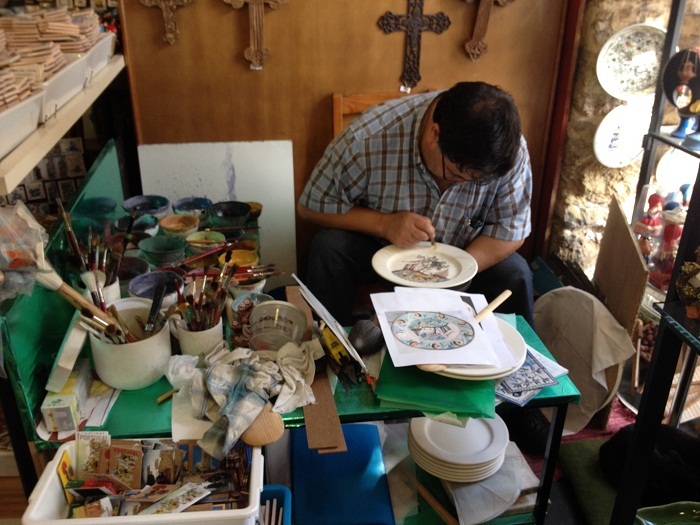 He was painting a plate with traditional designs. After painting, it was to be fired in a kiln. Beautiful stuff. It’s pretty clear to me that Brenda will be stuffing our luggage with some. Can you say 50 lb maximum weight? As it’s nearly dinner time, perhaps I’ll close with a photo of last nights’ dinner, beautifully presented. 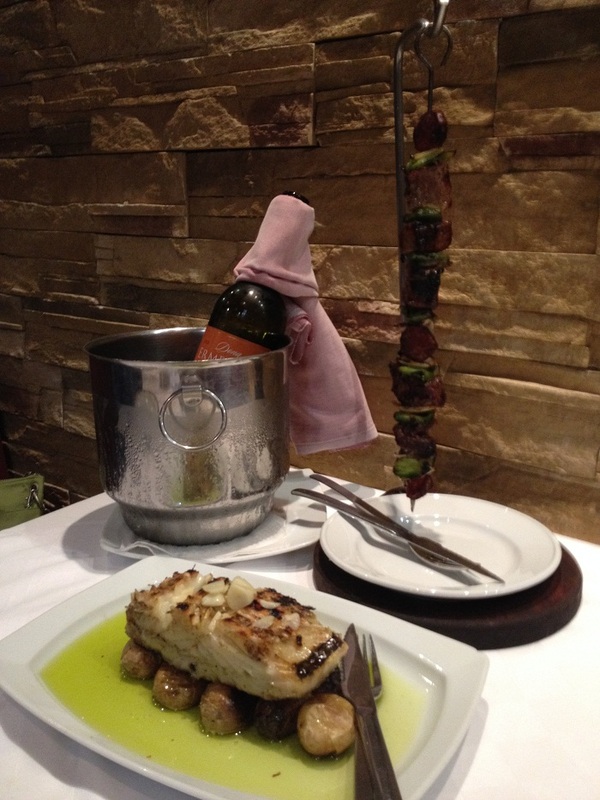 Grilled cod and pork shish kebob. (did I spell that right?) Yum. Oh yeah. I almost forgot. 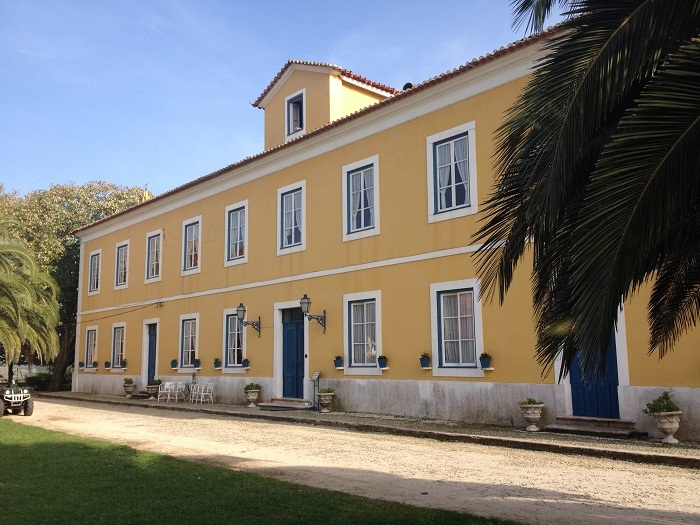 We really enjoyed our visit to Quinto do Campo, the inn in Valada dos Frades. That was the place that was originally built some 900 years ago that I wrote about a few posts back. We really enjoyed staying in their home. They treated us like family and we’d love to have them visit us in the US some day. What a nice group. The only one of the picture that actually lives there full time is the guy in the blue shirt. The rest of the group comes up on weekends. Well, I had better sign off for now. Dinner’s coming up. 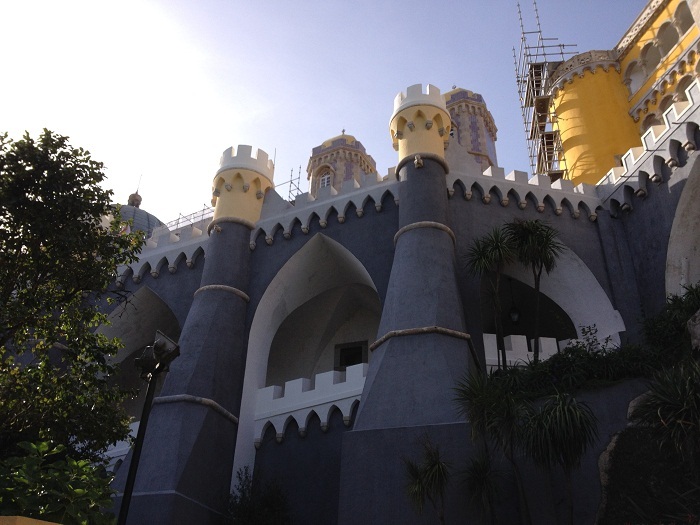 Oh well, more castles…. Wow! Look, Chickens! 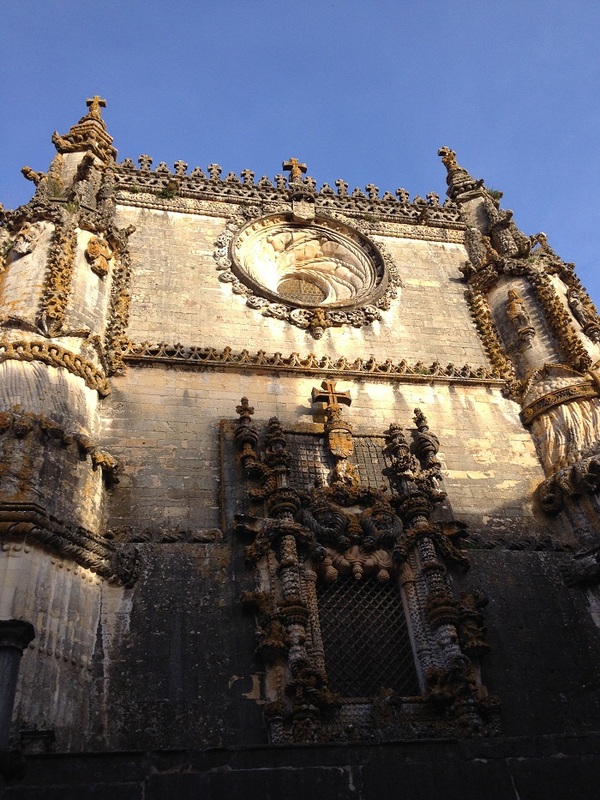 It’s Sunday morning and yes, they set their clocks back in Portugal too. How fun, now I get to adjust to yet another time change. Anyway, the good new is that I have EXTRA HOUR to write more about CASTLES! Yesterday, we drove around and spent time touring two more castle. 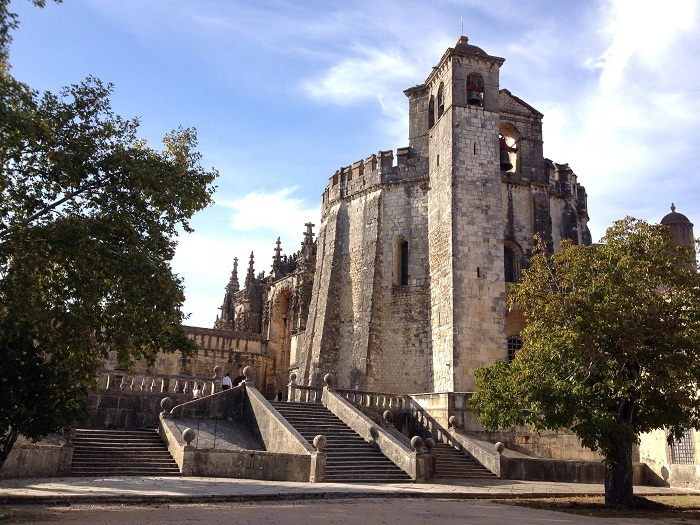 Portugal really has a LOT OF CASTLES. It’s really remarkable how many castles a country can accumulate when they measure their history in thousands as opposed to hundreds of years. It’s very different as a some folks here live in houses that are four times older than our country. Well, that’s OK, I guess. When Brenda and I lived in NJ we had 5 (count em) shopping malls within a 15 minute drive from our home. And yeah, and we even have Epcot too! It took a really long time to build this…and this is only the part that’s visible from the square. It’s really a pretty fancy place. Actually, this was the home to lots and lots of monks and it’s technically not a castle. 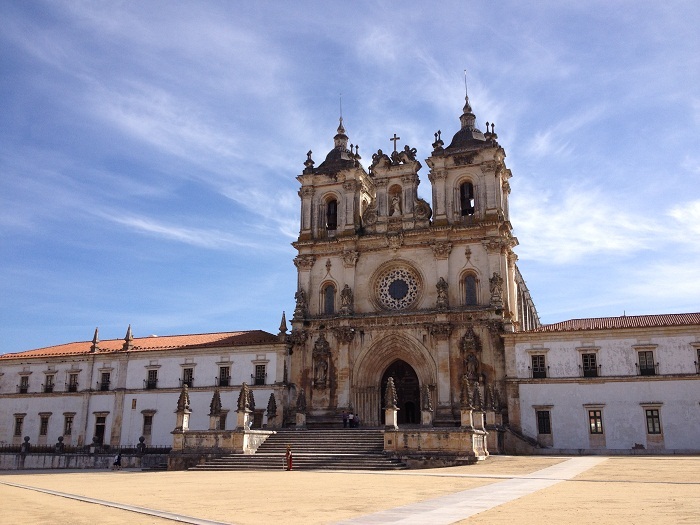 However, my point remains… This is the monastery at Alcobaca, perhaps the most elaborate in Portugal. Wikipedia tells the history better than I could so check it out. 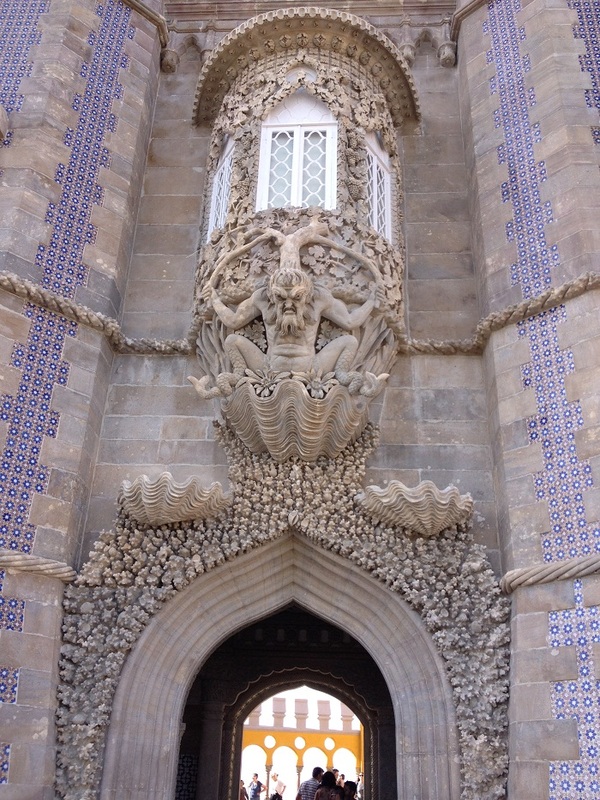 This is one elaborate building. And it’s been there for a VERY LONG TIME. Seriously, the level of detail is just amazing. 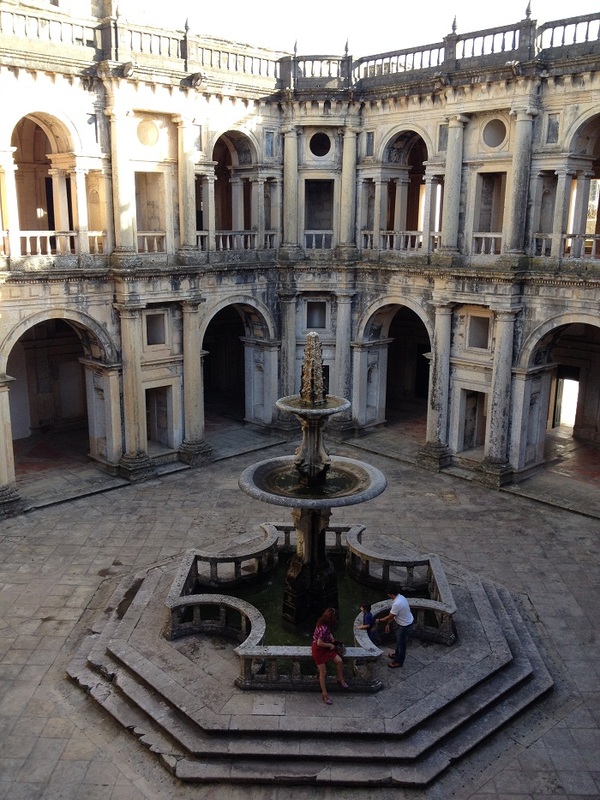 And the spaces…beautiful. Me, I could “contemplate” very well in this courtyard. 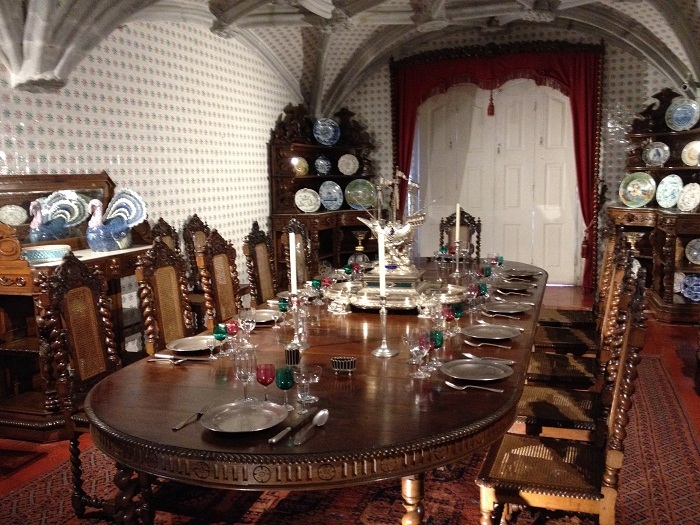 How about this as a kitchen in a “model castle”? Yes, I’ll take one of those. That huge tiled thing in the center is the chimney for the “stove” and it’s several hundred feet tall. . And, they even had a aqueduct, several miles long, built to bring water to the kitchen. Check out the marble counter top. Now that would be a great spot to roll out some pie crusts. No, make that a gross of pie crusts… It must have taken a lot of pies to keep the friars happy. And, on top of that, there’s “pies for the poor” to give out. And, that was just our first stop of the day. Anyway, this castle tops all. And, they were clearly ready for any sort of siege that might come their way. Look at this footing for the walls. I’ll bet that took generations to build. And, that’s just to protect the front yard. This is what you see when you enter. Nice digs. Actually, the knights were pillaging all over Europe on behalf of the Catholic Church and after that it became a convent. 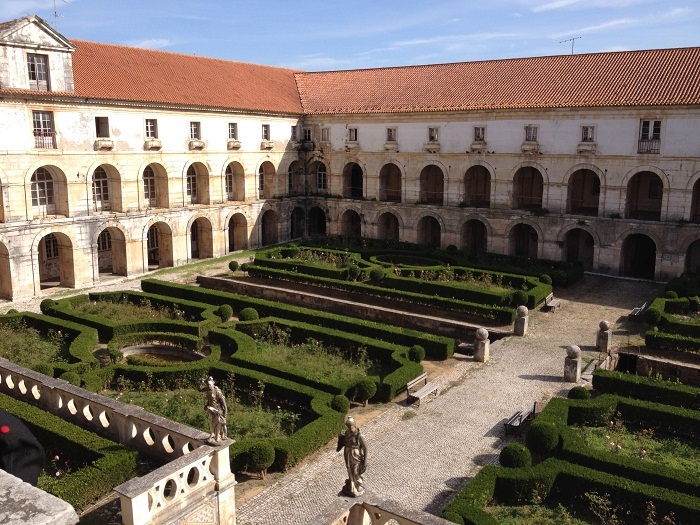 It’s a remarkable place and one of the most important historical sites in Portugal. 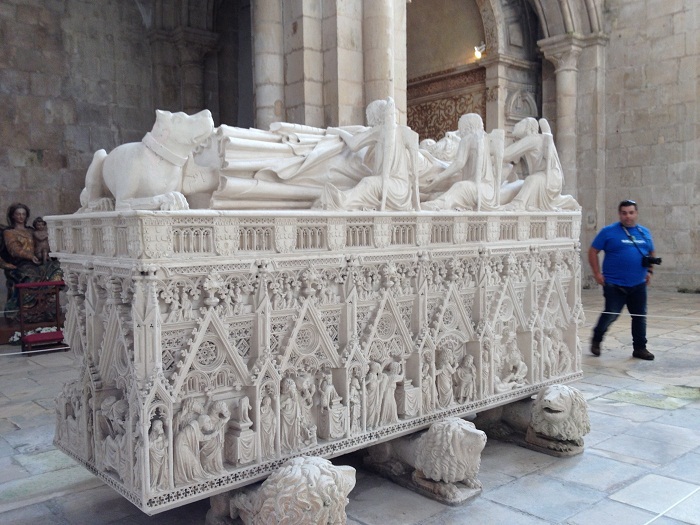 The Templar guys and the wealth that they accumulated supported the maritime voyages of discovery for Portugal in the 15th century. There was clearly a lot of wealth concentrated within these walls. The chapel is amazing and in wonderful condition and a great deal of care has gone into refurbishing it. 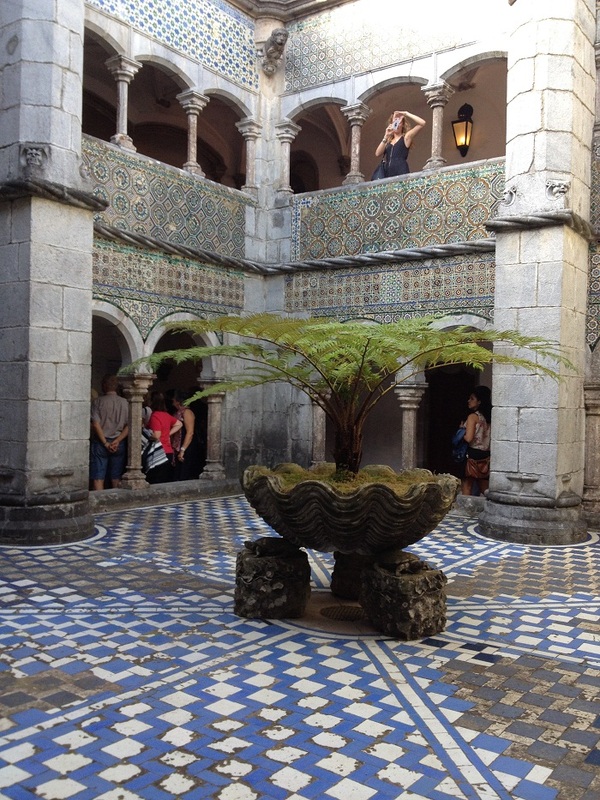 And, what a great courtyard, one of several. I would imagine that planning pillaging required proper places to prepare in. The level of craftsmanship. Amazing. 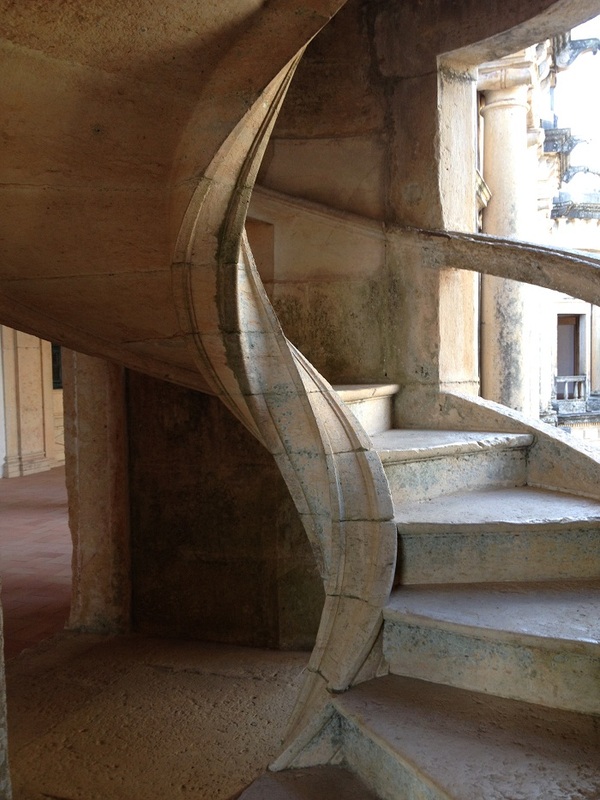 How about this spiral staircase? Everywhere you look, more over-the-top detail. And, all of this was done without the aid of any sort of heavy lifting equipment beyond levers and pulleys. Make that lots of levers and pulleys. Look at the lower window. The grate is made of stone. How’d they do that? 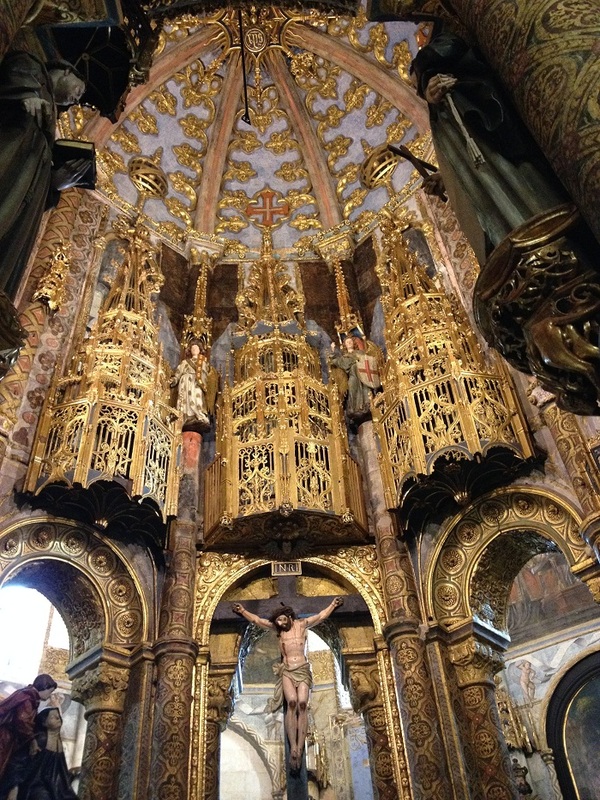 It’s hard for me to imagine the kind of dedication, and availability of raw labor, to make something like this possible. I’ll bet that they didn’t have any problems with labor negotiations either. Hmm… I’m not thinking that you said no to the Templar guys, ever. Perhaps best not to think about that. “Bob, Bob, what’s with the chicken thing in the title?” Oh yeah, chickens. 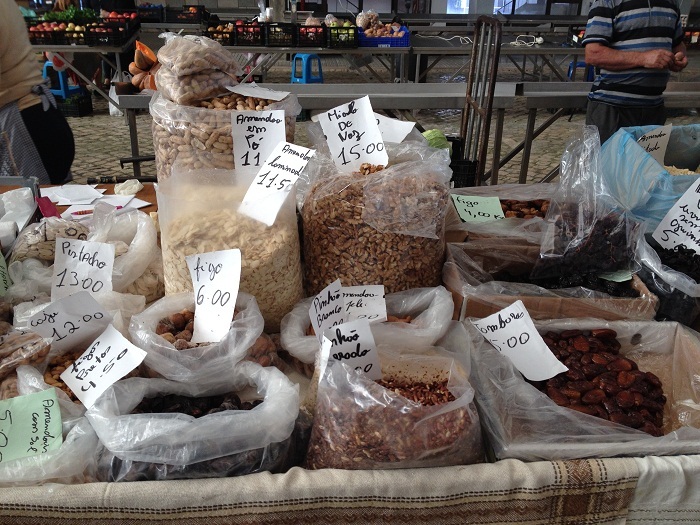 We also visited a farmer’s market. No plastic doodahs for sale at this market. 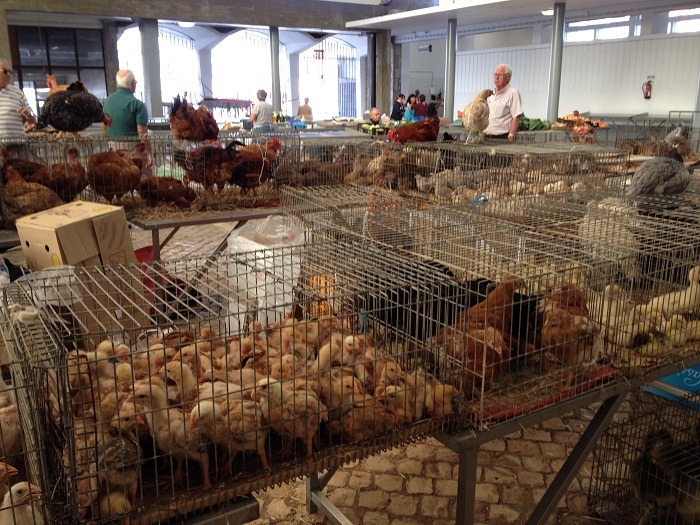 This was a REAL market, complete with chickens. 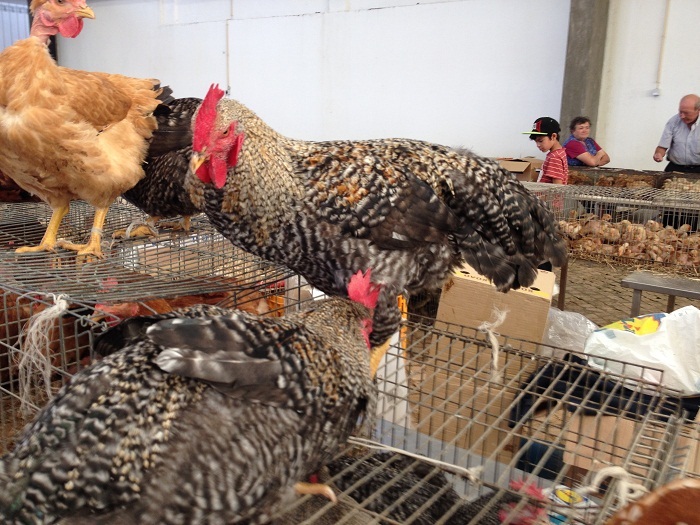 Lots of chickens. Little one and big ones. All sorts of great stuff. 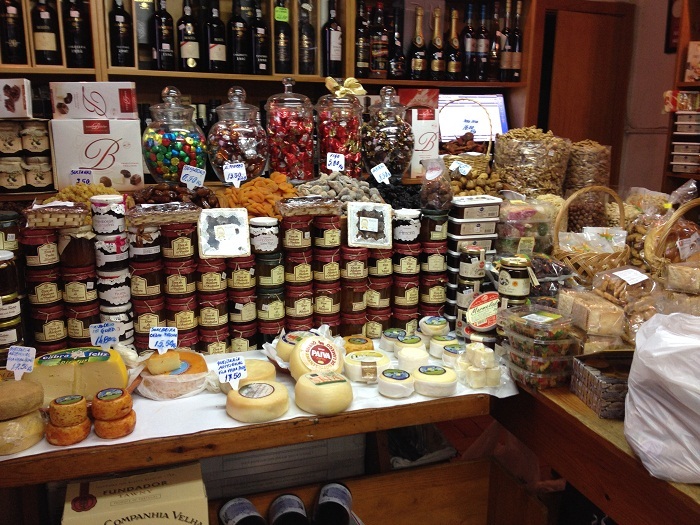 We bought some cheese, dried fruit, bread, olives and pastries and had them for dinner here at the inn last night. Very nice. We’d better walk a LONG way today to work that all off. Speaking of food, it’s time for breakfast. Gotta go. It’s Friday afternoon and we just got back from a day of exploring. Our first stop of the day was a lovely medieval town nestled inside the walls of an impressive castle. This one was, as they all are, perched on the top of a hill, but it seems that the owners of this one had to settle for a lot less vertical drop which must have made for a much easier life of it. At least until some other group of tough guys came on the scene looking for a new place to live. I guess that this particular town wasn’t pillaged to often as here we are today with a town that’s still intact and occupied. 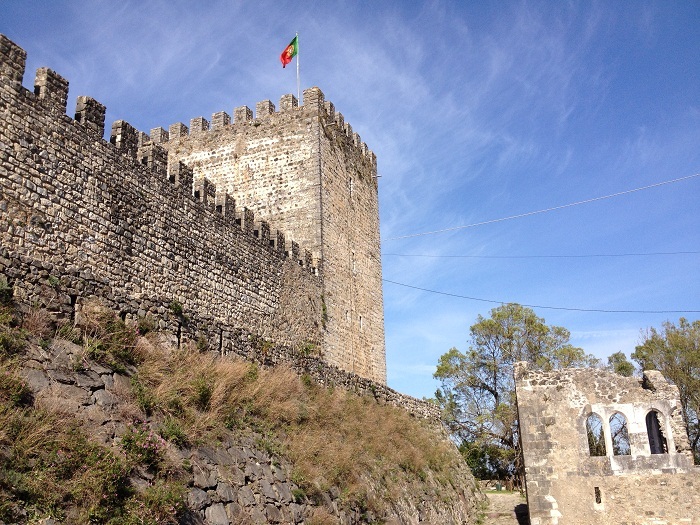 The castle walls surrounding the town are quite impressive and I would guess that there are more than 100 tidy homes nestled within it’s walls. I didn’t have the foresight to take a shot from the road as we approached. You’ll just have to click here to see a description of it. It seems that this place has been occupied since the Romans. That’s a long time. I’ll bet that there have been a slew of renovations since then. As you enter the walls of the city, you are greeted by, guess what? Tiles. What else. We are in Portugal after all. Everywhere you turn there is a beautiful view. 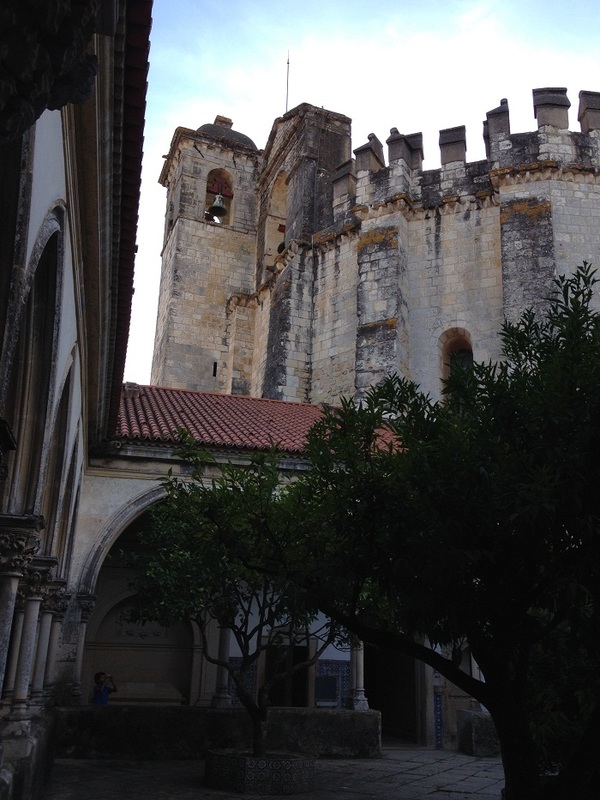 There were several churches within the castle walls. I’ll bet that the residents spent a lot of time praying that the next conqueror to take the village wouldn’t have “terrible” as part of his name. 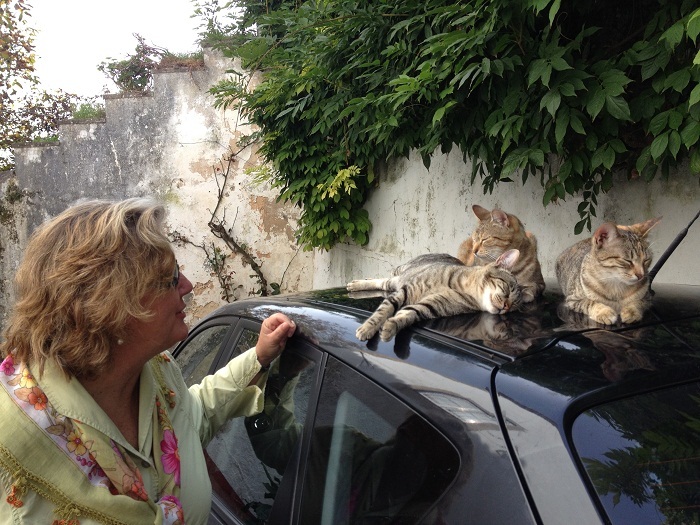 Along the way we came upon several kitties, obviously related, enjoying a nap on the top of a Renault. Nice day for a nap, I’d say. Brenda wanted to take them home. 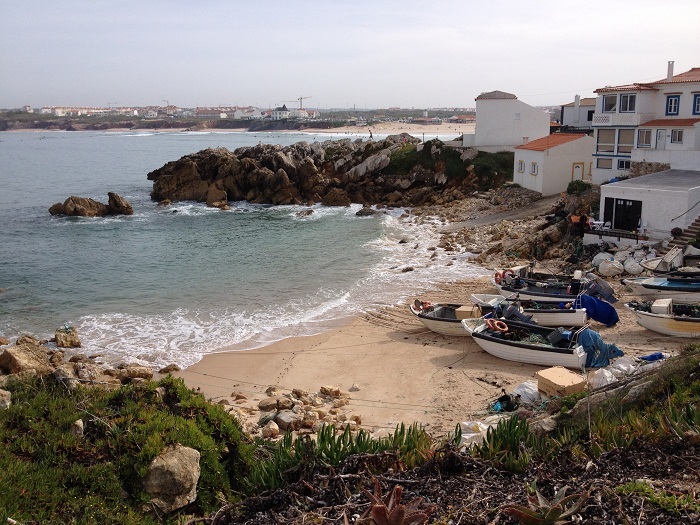 After that we drove up the coast to visit the seaside village of Peniche home of yet another fine fleet of fishing boats. The coast is amazingly rough. This video doesn’t do justice to how treacherous this stretch of coast is. Notice ththe fishing boats in the distance as well as the fisherman. Everywhere you look the scenery gets more and more dramatic. This sign makes the point. And let me tell you, every so often a really big one can come up on you. The graphics are well, “graphic”. You get the point, words or not. 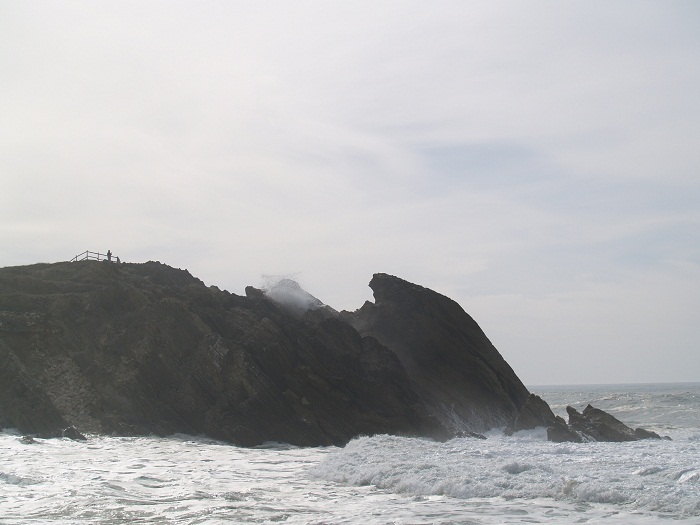 And nothing says “stay away” quite like a massive lighthouse perched on a huge rocky cliff. Just around the point is a harbor, one of very few for many miles up and down the coast. 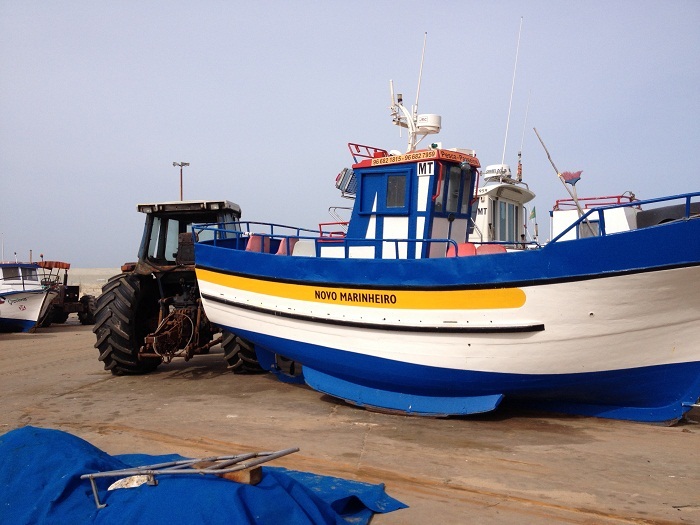 The boats here are bigger than in other areas that we have visited. I went into a building where fisherman were selling their catch to a broker. It didn’t look to me like they had caught much. 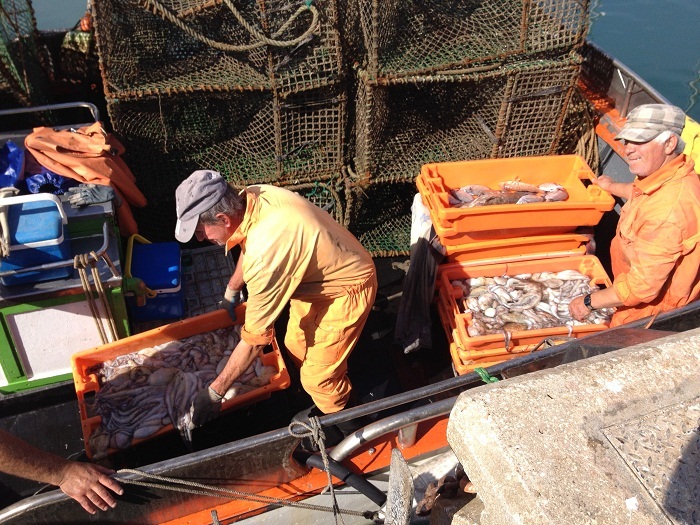 Quite a lot of fisherman and only a dozen or so boxes of catch. In town there was yet another castle and nestled just outside of it’s walls, a few locals were having a cookout on the beach complete with some nice red wine. They didn’t ask us to join them. However, as a group of young women peered over the edge… Yes, they invited them to join them with much arm waving. Alas, no takers. Everywhere there is even a tiny bit of protection from the surf, there will be fishing boats. Launching through the surf is just part of a day. And just on the other side of the cove you can see a beach. We saw, lunch! And after an exhausting few hours of touring of course, we had to have lunch, of course. The view from our table. Not so bad. 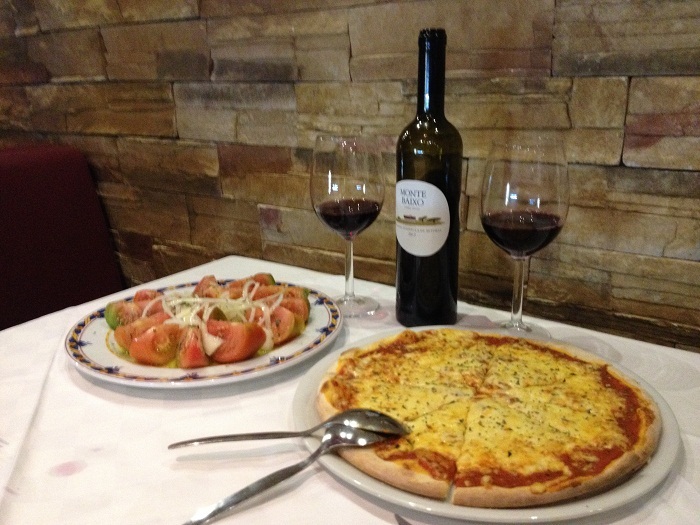 Food and wine? Good too. The road on the beach is on a narrow spit of land connecting this tiny island with the main land. I’ll bet that there are times when the road isn’t passable. Well, as I finish this post it’s getting dark so I guess it’s time to eat again. Yikes, we had better walk lots tomorrow to work all of this food off. Did someone say food? 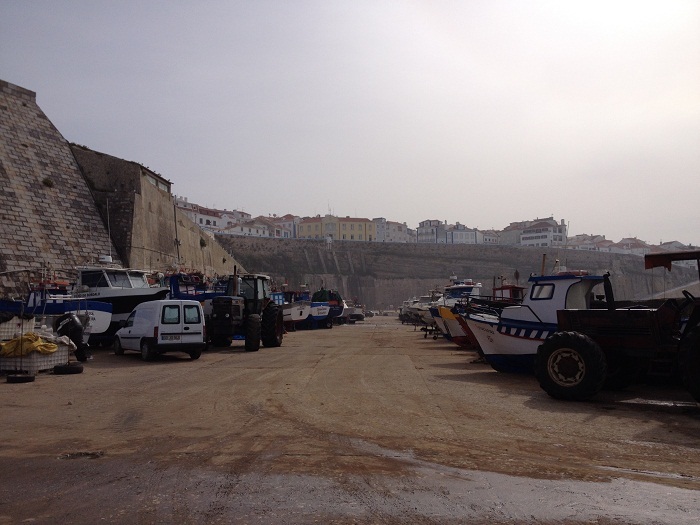 Nazare, boats and some beach time, sort of. It’s Thursday afternoon and we just got back from a day trip up the coast and back. 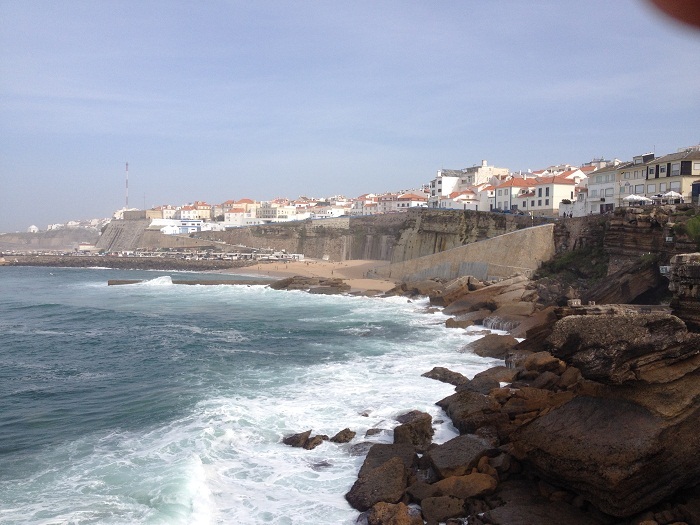 We are staying very close to Nazare, a small resort town and fishing village. 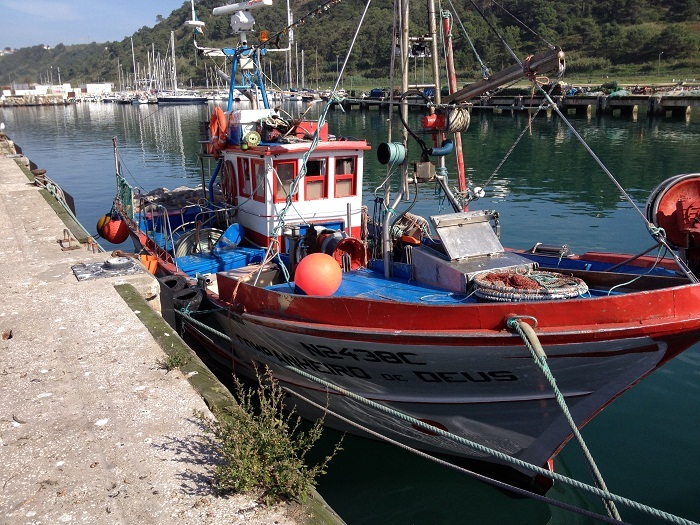 As is the case up and down the Portuguese coast, there are very few protected harbors. 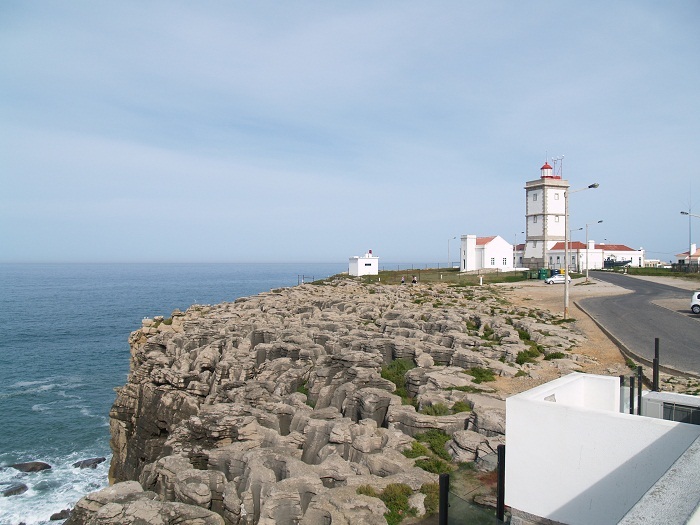 In Nazare, they have carved out a very well protected little harbor inside of two gigantic breakwaters. 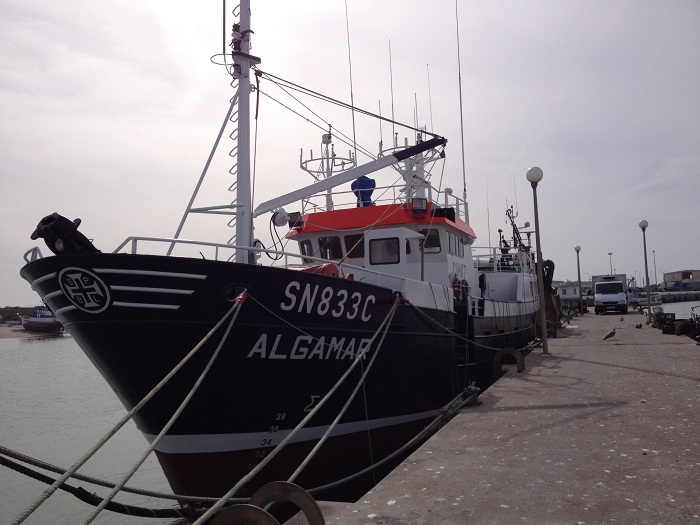 Inside is an interesting mix of commercial fishing craft and some sailing and power yachts. Most of the boats in the harbor were less than 40′ and it was pretty clear where the pleasure boats and working craft were located. Not together, as by and large, they didn’t mix. I guess that the “yacht set” didn’t want to smell fish. Me, I was drawn to the fishing boats and enjoyed seeing the many colorful boats. In the distance you can see the “other side of the harbor” where the yachts are. 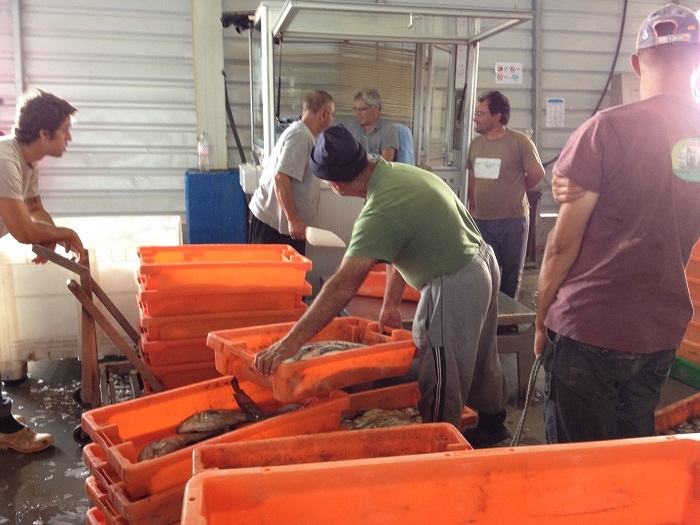 One group of fisherman were unloading their catch. Note that the two boxes closest to the front are full of octopus. or would that be octopi? Anyway, the other one has fish, or should I say fishes? 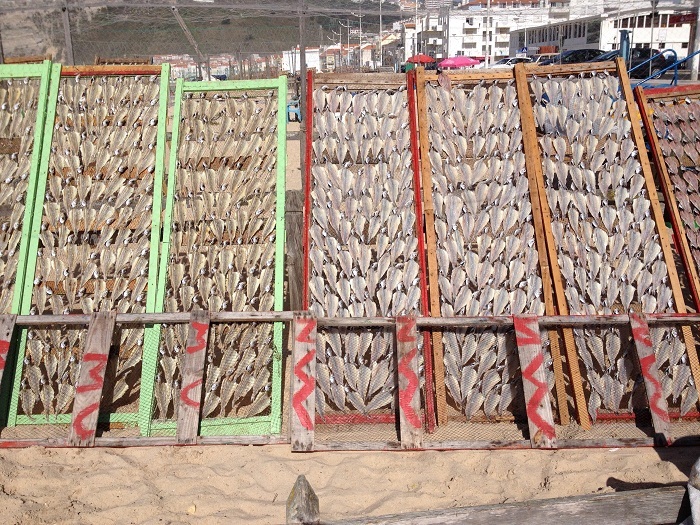 Nazare has several miles of wide beaches and along the way were large racks of split fish drying in the sun. Tasty yes? “Mom…The fish are looking at me!!! 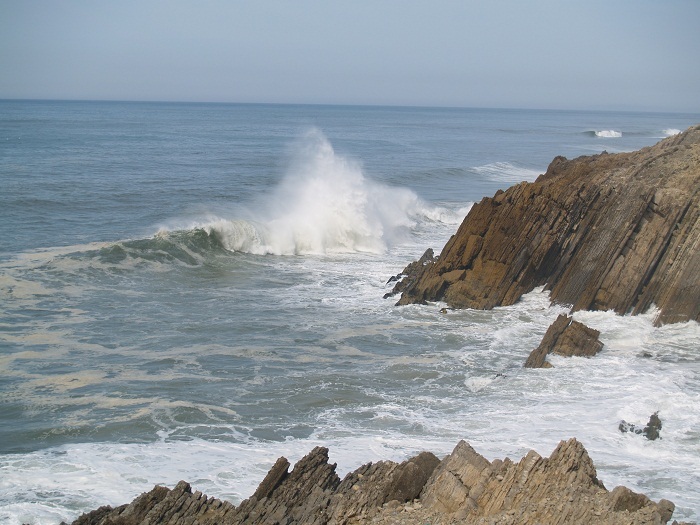 Tell them to stop.” We headed up the coast and stopped to watch the waves crashing up on the cliffs. I can only imagine what this scene would be like in heavy weather. 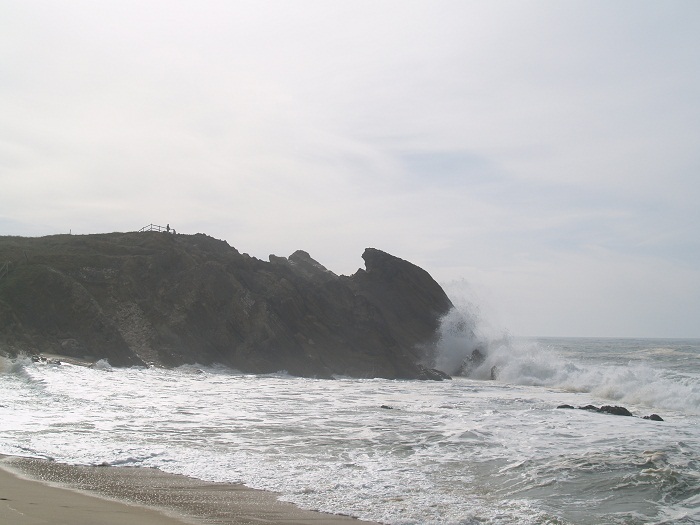 In spite of it being a calm day, with no wind, the waves were sometimes crashing up as high as 100′ cliffs. The noise was deafening. If you think that these waves were more wimpy that I am describing. Trust me, you had to be there. It’s hard to understand how big these waves were and how high the spray was going. However, one minute in this surf and you’d be crushed. 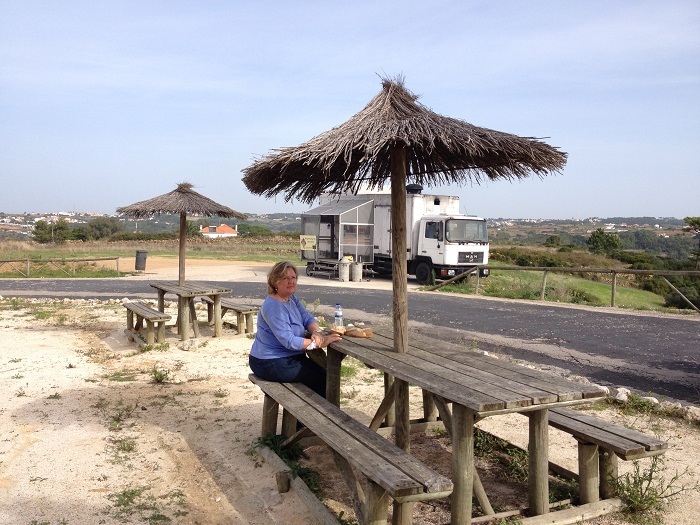 So, after that, we headed up the coast a bit further to have a late lunch. We’d have eaten earlier but we weren’t able to find the place suggested as we blew by the “exit” on the coastal road. Anyway, we finally found it. This beach was several miles long and nearly deserted. We were told that, in the summer, it is mobbed. The waves were huge here too. Quite a few surfers. Interestingly, we drove along the coast through mile after mile of pine trees in what looked like a huge managed pine farm. 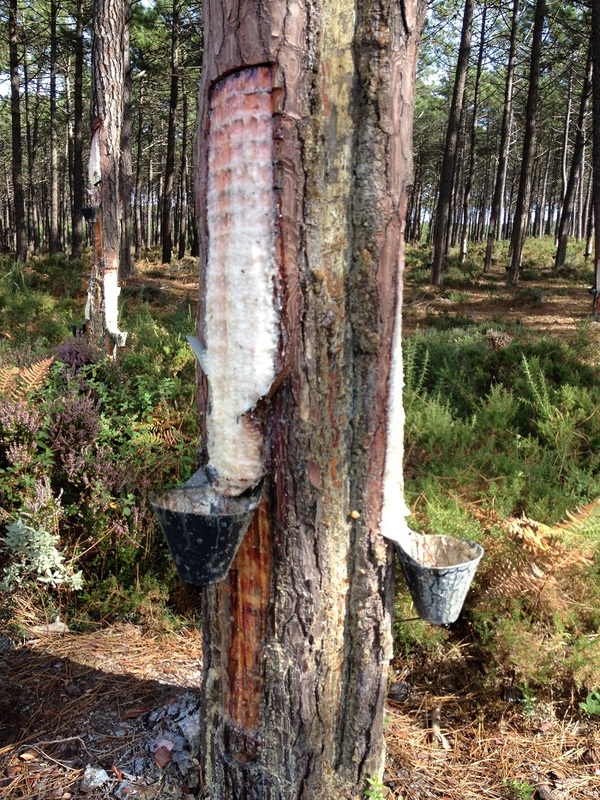 Nearly every tree for miles had these cuts in the bark to collect pine sap. I wonder what this is used for. You’d think that the process of cutting such a big slab of bark out would kill the trees, but it doesn’t. We saw trees where the bark had grown back over the old scar. We did spend some time on the beach, no make that looking at the beach. 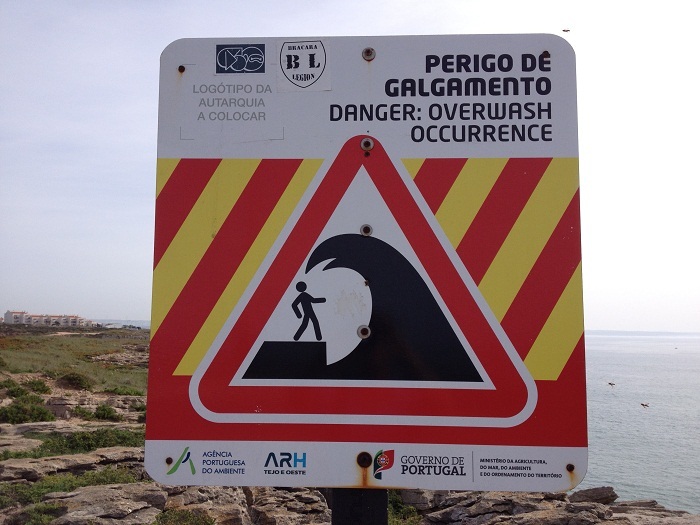 No swimming in monster waves for us chickens. Besides, we are told that the water is always cold. No, I’ll have an ice cream. Brenda and I are happy to watch others in the cold surf. Besides, it is nearly November. Perhaps I should wrap this up for now and start to think about dinner. I know, I’ll go wake up Brenda from her nap. Yes, good idea. Tonight we are going to head into the village for dinner at a place where locals eat. We got a bottle of wine at the the grocery and were stunned, as always, by how low the prices were. There wasn’t a bottle in the place for more than six Euro. The best bottle of port was only 7.5 Euro. No wonder many places have a sign that says “a meal without wine is breakfast”. 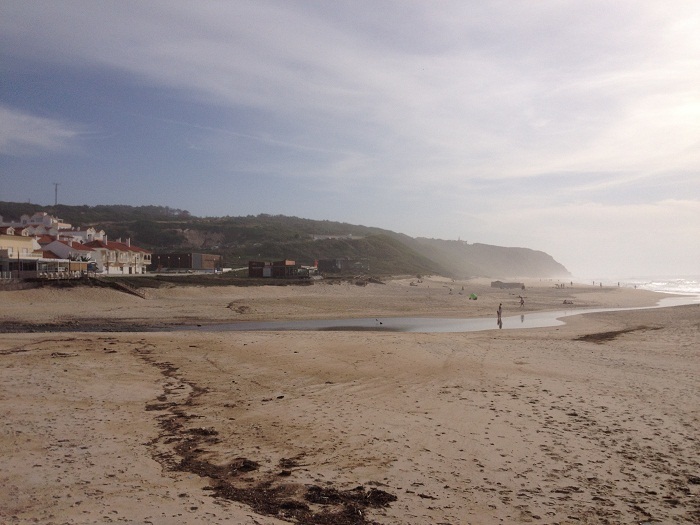 It’s Wednesday afternoon and we have just arrived at Quinta do Campo, a lovely Inn near the seaside resort of Nazare. 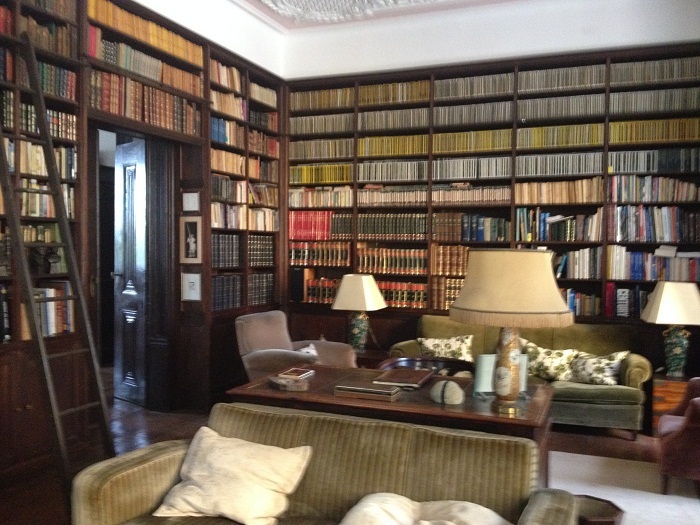 The owner met us at the door and gave a breathless description of the 900 year old estate. It seems that this was at one time a monastery serving a local castle and has been in his family for hundreds of years. Anyway, they now have turned it into a B&B and they also do a lot of meetings and weddings. It’s an amazing place. Check out their site for a video of it’s history. I hope that you speak Portuguese. If you don’t, there are words to follow and it’s quite interesting. We’ll be here for a few days and then will continue north. Our plan is to book each location a few days prior to arriving so we can be flexible on our itinerary and adjust as we go. This approach is taking a bit of getting used to for Brenda who gets a wild look in her eye as soon as we are within a few nights of being homeless. I expect that she will begin exhibiting symptoms beginning Thursday morning but I am sure she will find something really great for our next stop. 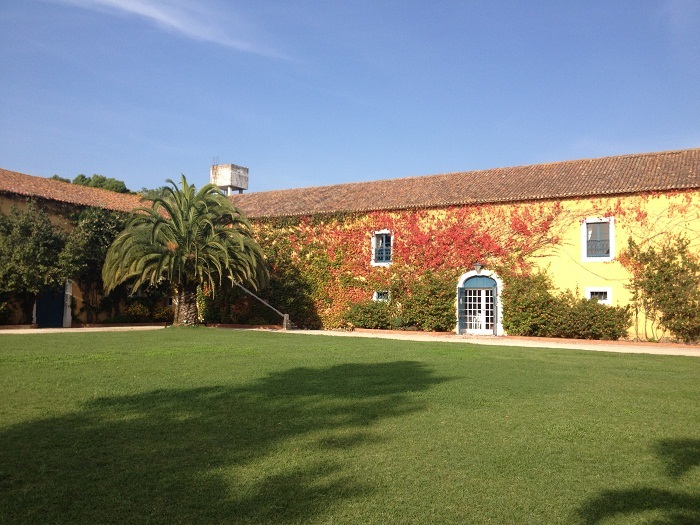 Here’s a view of the front of the “main house”. It’s fairly new, only “hundreds” of years old. This part, 900 years… That’s pretty old, I’d say. I’d love to look this nice after 900 years. I understand that there is a big space inside where they do weddings. The next time Brenda and I get married, perhaps this will be the place. Talk about a destination wedding. 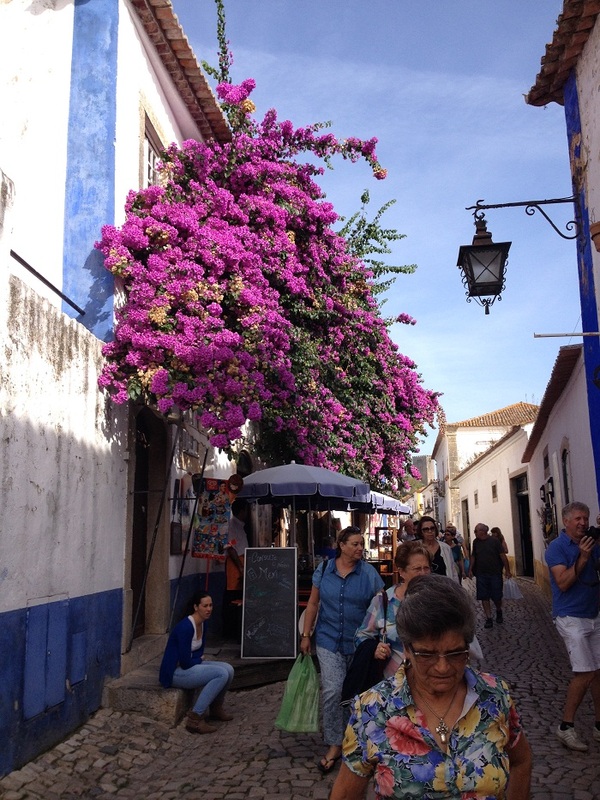 Want to go to Portugal? This is the library where I am doing my post. Alas, no WIFI in our room. Imagine… How archaic. No wait, this place is archaic…really. However, in spite of the age of this place, the Internet is the best we’ve had yet. Perhaps it’s not that antique after all. Today we drove from Sintra up here via mainly local roads and that involved many, many roundabouts that everyone takes at breakneck speeds. 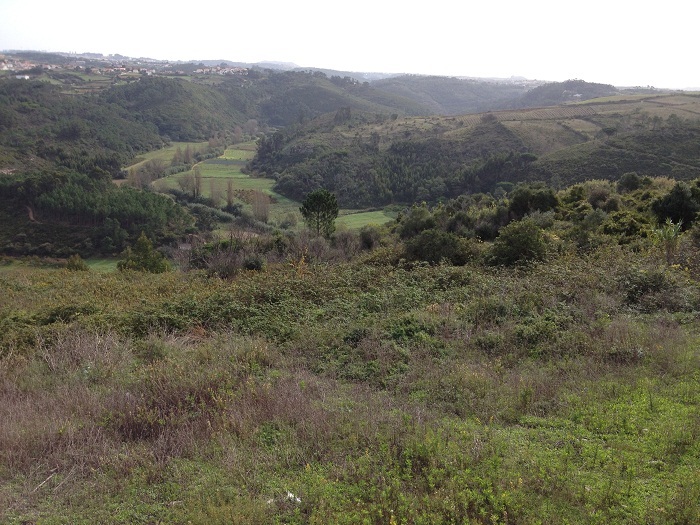 Along the way we spotted a lovely area to pull off and enjoy the view of the rolling countryside. What a view. Then, we noticed this funky food truck. Inside was a commercial bread mixer humming away and two women turning out hundreds of wonderful smelling fresh baked breads and treats. 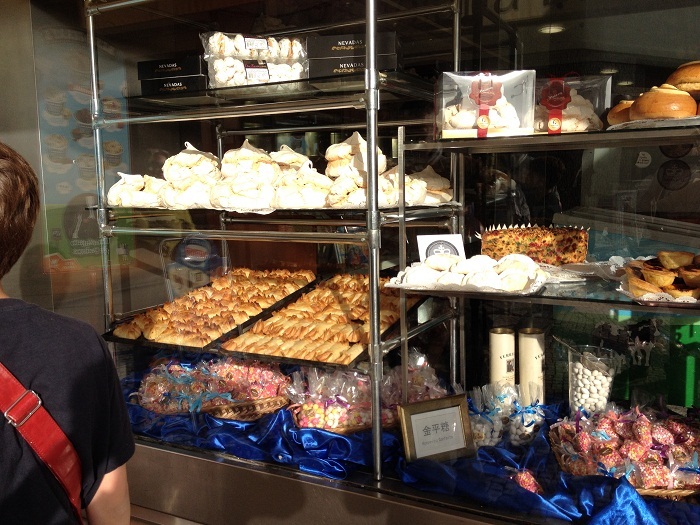 It turns out it is a coal fired mobile bakery and we bought a fabulous baked ham and cheese sandwich fresh baked roll. 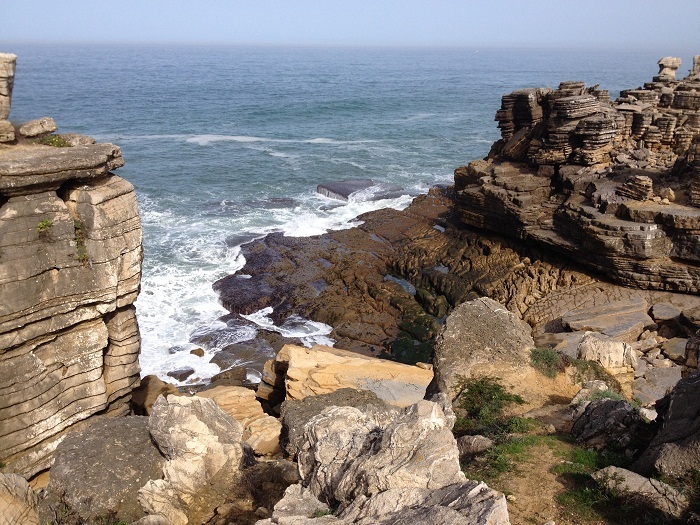 We wanted to see some of the coastal areas on our way north so we took some local roads, sans GPS and decided to visit a lovely fishing village, Ericeira. 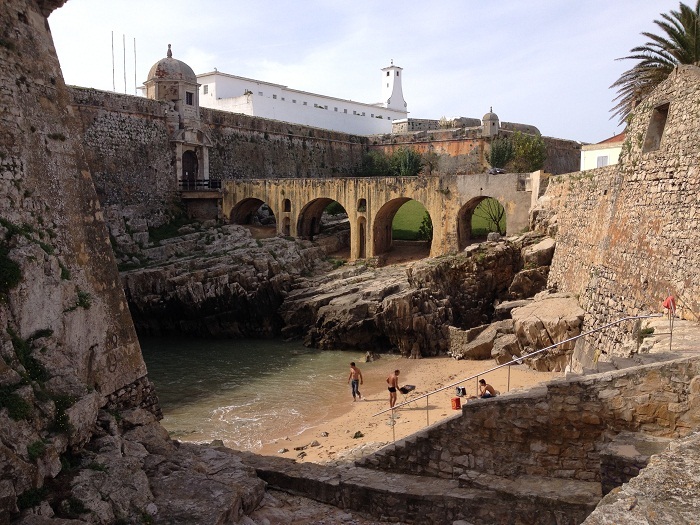 The town is on a cliff overlooking the Atlantic and there isn’t a harbor, just an enormous breakwater that juts out into the ocean. The view of the “harbor” is beautiful. However, “harbor” isn’t really a fair description as there were 4-6′ waves crashing up on the beach in the harbor itself. This place makes the open harbors of the Bahamas look like a lake. And, today was a calm day. 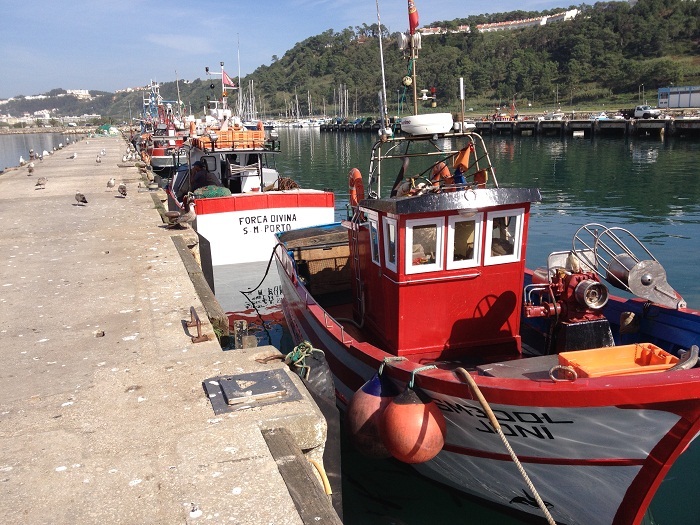 This is a real working fishing village with lots of traditional and modern small fishing boats. 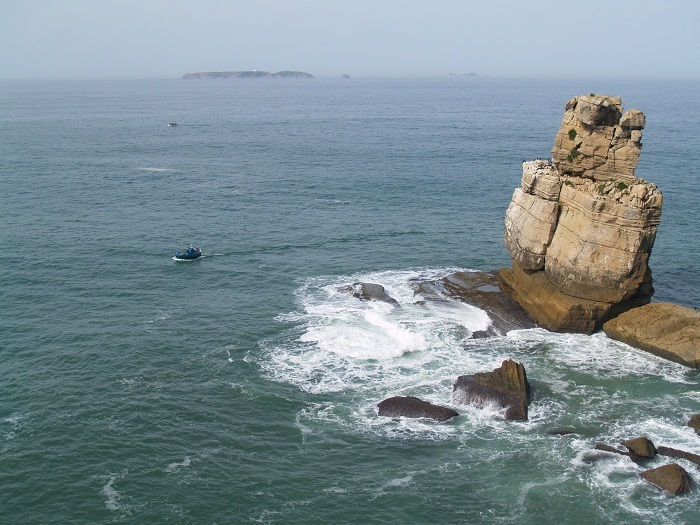 The harbor is under a massive cliff reinforced with concrete. This part was a sort of rugged park area. I walked out on the breakwater and took a panorama to give you an idea of what it looks like. 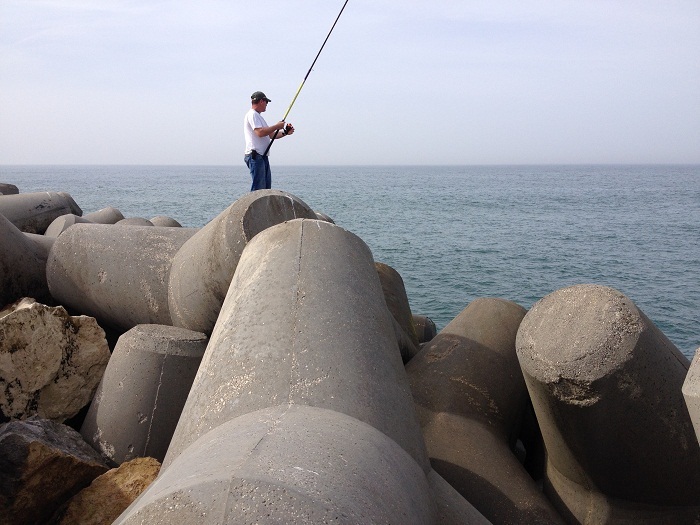 The breakwater was made up of hundreds of enormous “jack” shaped cement forms, stacked up on one another. This photo shows how big they are. No this isn’t an illusion. They are huge, tens of tons each. Amazingly, many were broken from wave action. Imagine what sorts of waves would break something like this. The waves were crashing up everywhere. I can only imagine what a winter storm must look like. To the right was a boat ramp where boats were attached to a tractor and dragged up a concrete ramp. Timing things right was a team effort. The older boats have iron skids on the keel and bilges so that they can slide right up on the ramp. 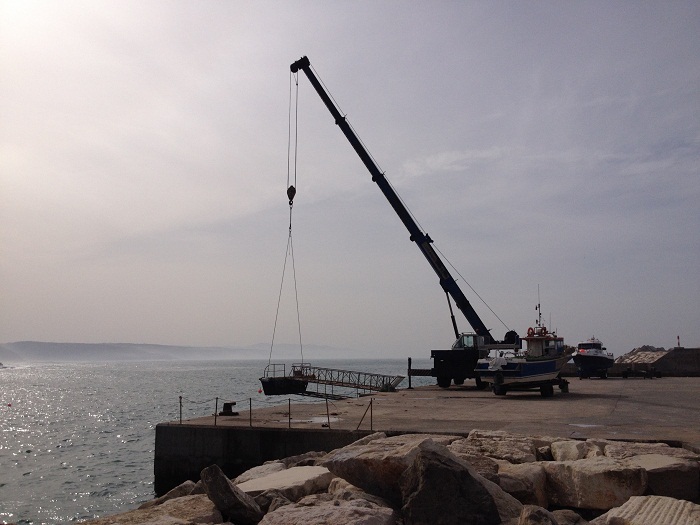 For the newer boats, made from fiberglass, they are lowered into the water from a crane. 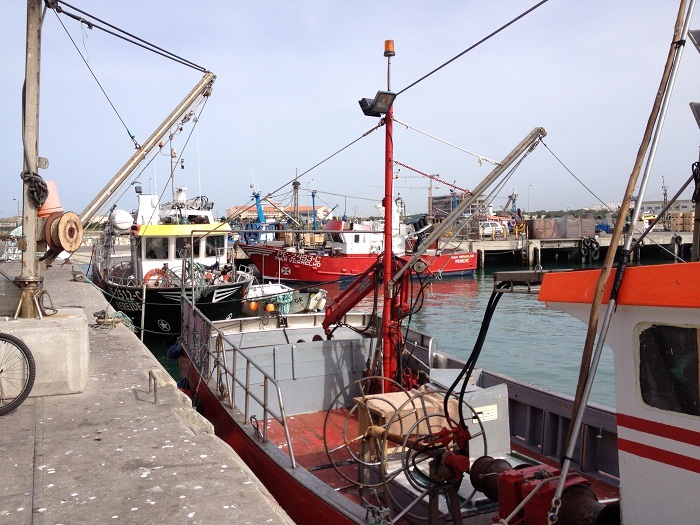 All boats are taken out of the water immediately upon entering the harbor. The “boatyard” was jammed with all manner of craft. Some were very colorful. 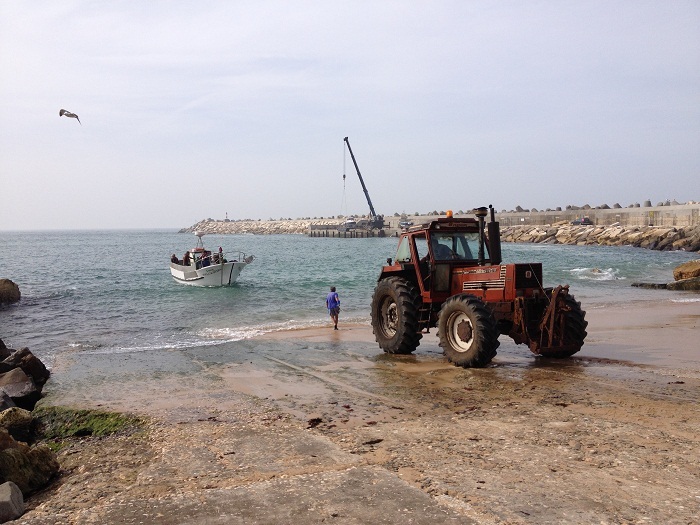 Notice the hard chine with the iron shoe to skid along the cement when the tractor is pulling them too and from the water. Along with the boats were huge amounts of fishing “stuff”. 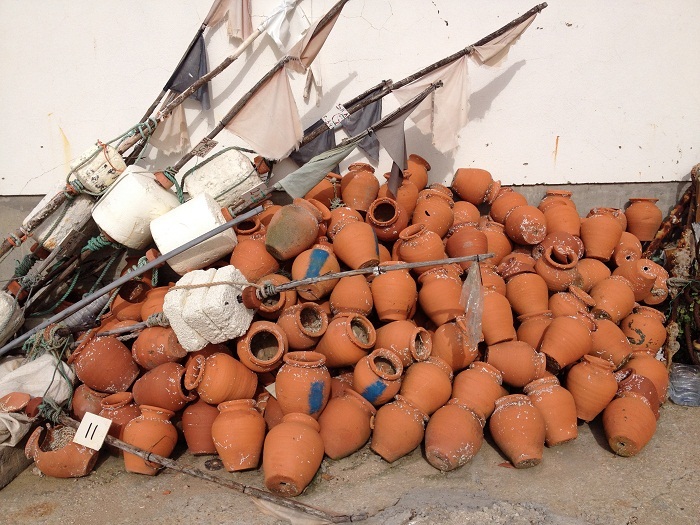 I was particularly taken by this pile of ceramic jugs. 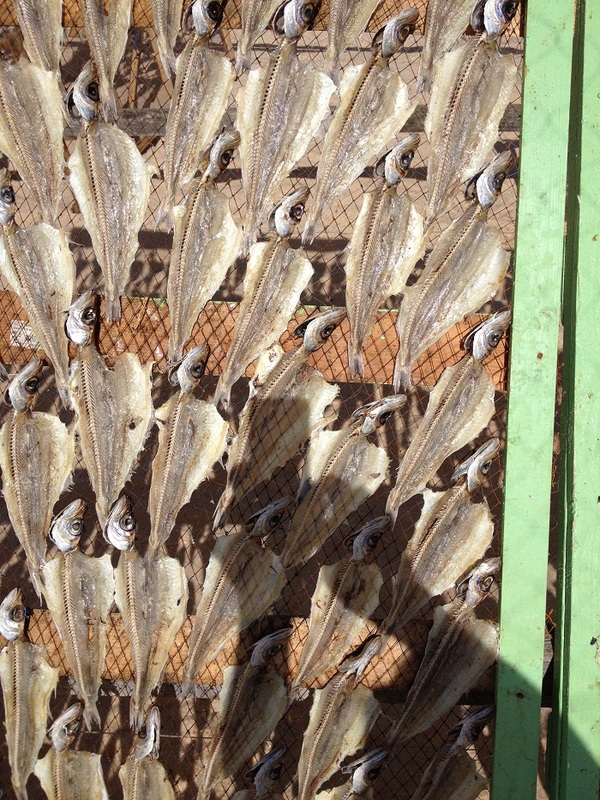 They are used to fish for octopus. These are left in the water for a period until a local octopus takes up residence. Then they pull the jugs up and, what do you know, octopus for dinner. It was great fun to travel up the coast today and see the sights. Tonight we’ll head somewhere local for dinner. 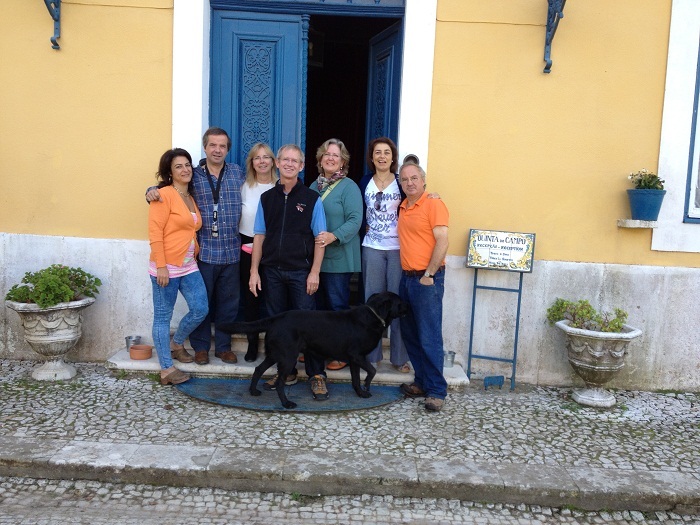 We’ll be here for a few days and then we’ll head up toward Porto, home of the famous wine by the same name. Off to find a nice bottle of wine for cocktails. 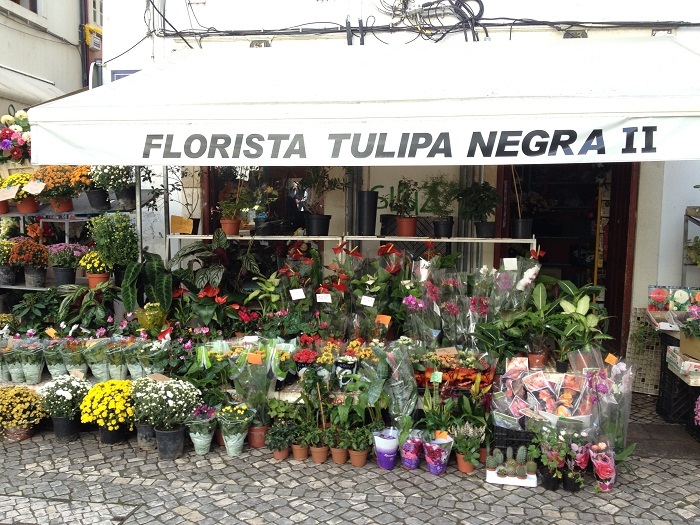 It’s Tuesday morning and we are in Sintra, about an hour’s drive from Lisbon. The weather is very nice with warm days and cool nights. We are staying at a lovely old B&B that was once owned by the government and is now private. It’s located just outside of town and like everywhere else in this area, is on a hill, no make that the side of a mountain. In “days of yore” this must have been a pretty rough place to live where “might was right” and the baddest guys got their way, well at least until a “badder” guy came along. 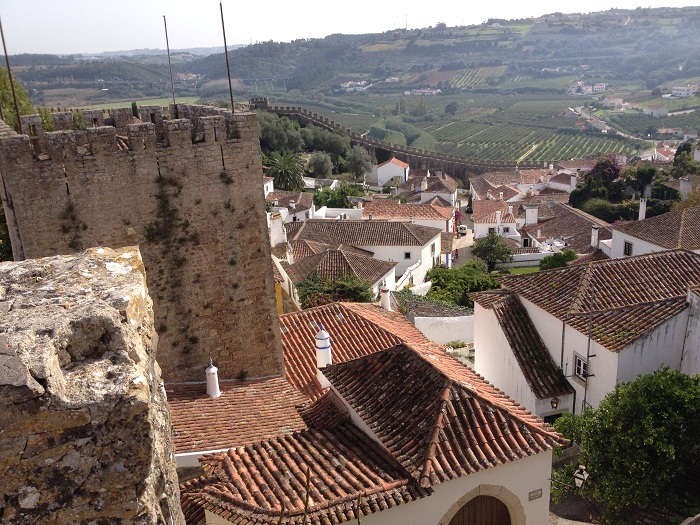 And, there is an amazing castle that overlooks the town and overlooks our inn too. Believe it or not, this is the view from our room. Amazing. Our room is the corner one in the tower. No kidding. Nice job Brenda, for finding this place. It seems that towns were generally built within a reasonable distance of the “tough guy’s” castle, where there was some level of protection from the invading guys who wanted to kill the resident tough guy and take his place. Anyway, towns were built under the watchful eye of the castle. 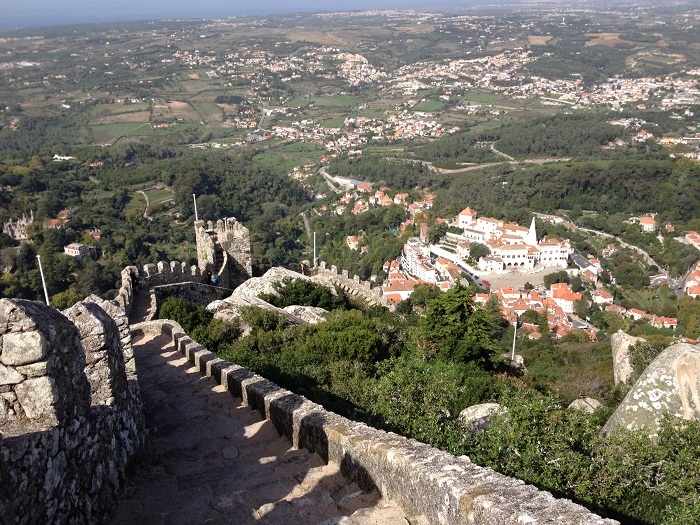 This is Sintra, viewed from the castle. In the distance you can see the Atlantic. The view is really amazing. I would think that you’d have several days warning if invaders were on their way. 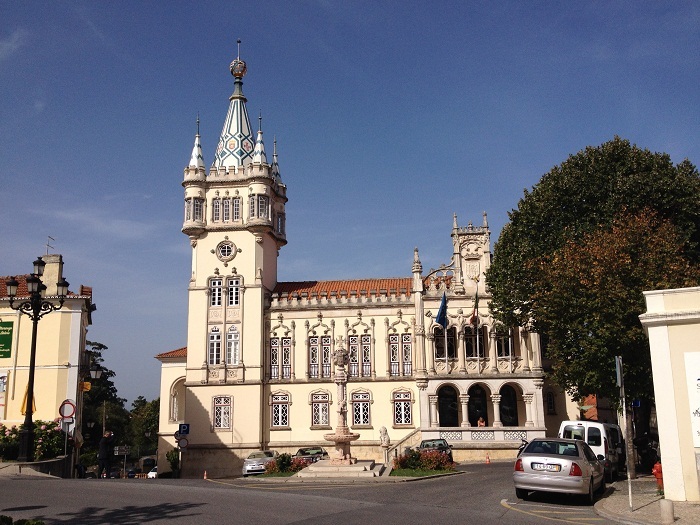 The town of Sintra has many lovely buildings. 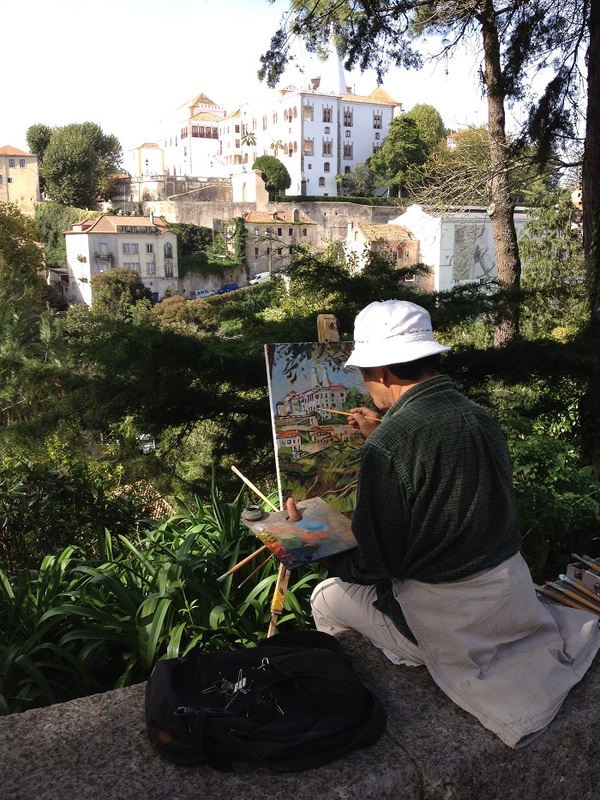 I enjoyed watching this artist painting in a particularly picturesque spot. 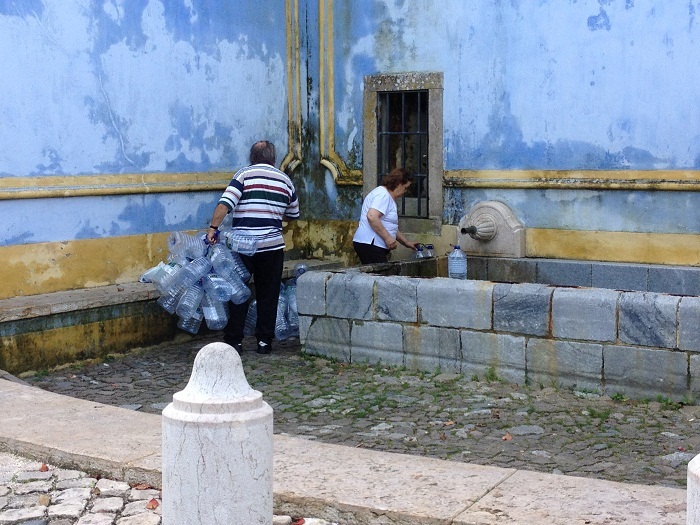 Actually, everything here is picturesque Even the local spring where folks fill up water bottles is pretty. The water at our inn is from a private spring on the property and there is so much water that spigots are left running at times to bleed off the excess. There is an old cistern that is no longer used out back and now is the home for many goldfish. 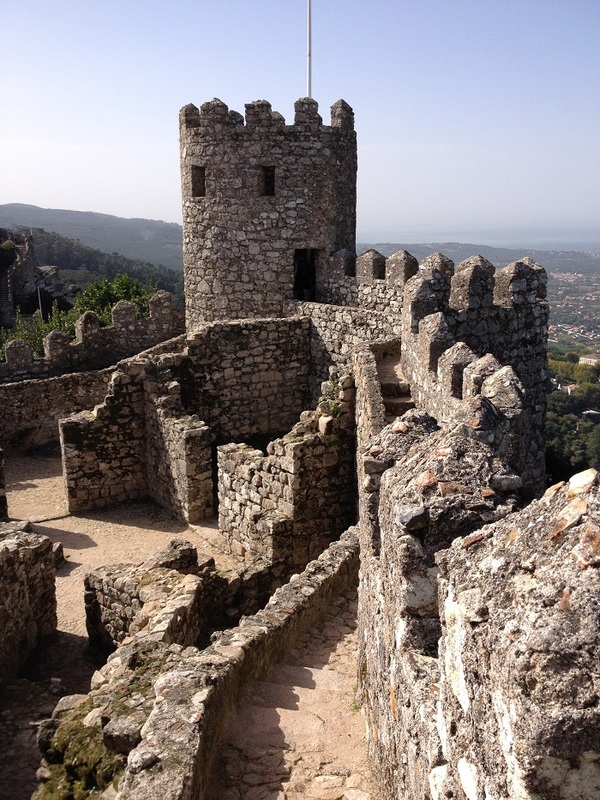 The Castelo dos Mouros was built during the 8th and 9th centuries and is quite an impressive place. I can’t imagine how hard is must have been to lug all that stone around in a time when all you had to work with was brute strength. 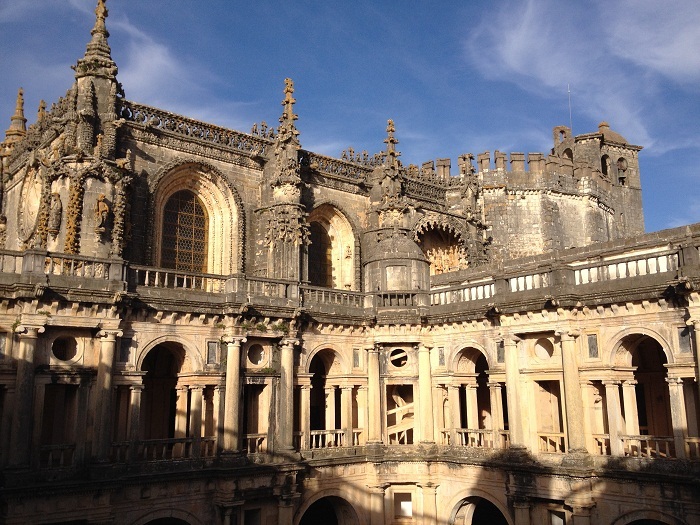 It must have taken hundreds of years and many laborers to build it. I would think that if the local “tough guy” asked for your help, well, you helped and said “how high do you want that wall”. Yes, that’s a real castle. Yertle the turtle would have loved it here and he would have been able to see a lot. 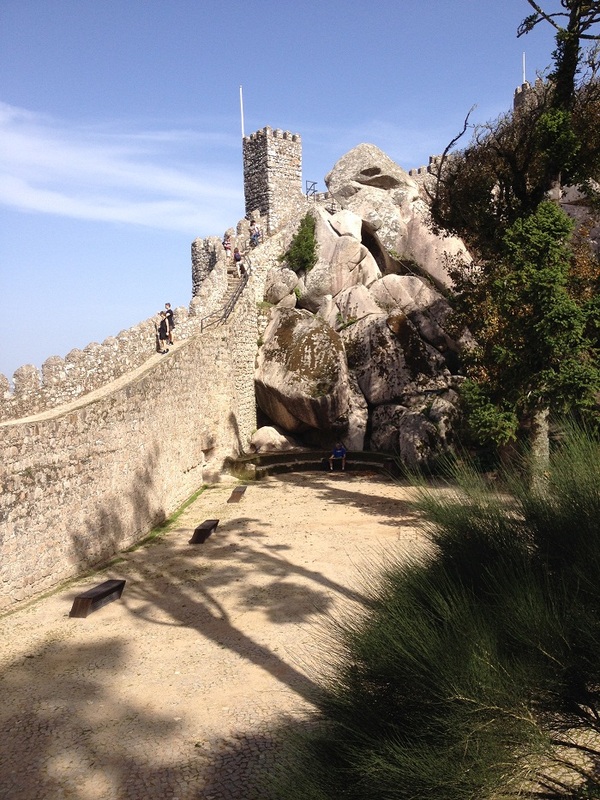 To walk along the top of these walls would induce vertigo in all but the most bold “knights of old”. There was a young woman who was sitting on the very top of the wall in this tower and to look at her made me weak in the knees, and not in a good way. It is truly an amazing place. Today, visitors take a bus and it’s still a long way up, both ways, to visit. We were pretty pooped at the end of the day. 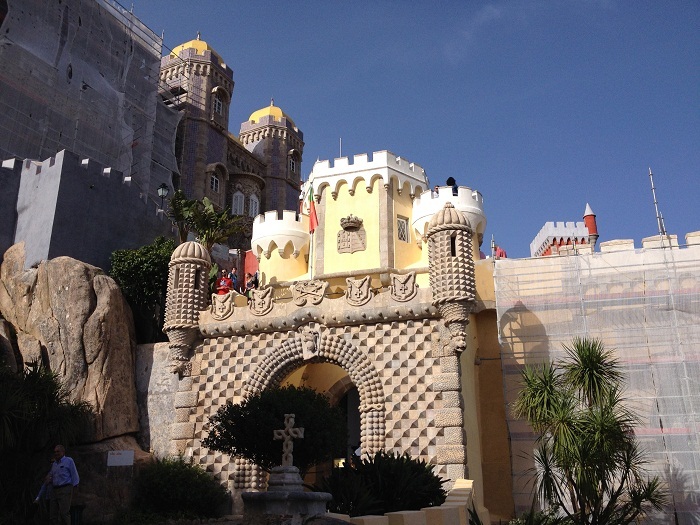 Yes, Sintra is indeed a lovely spot. And, it makes me appreciate even more that I live in a softer, gentler time, when life is not so “brutish and short”, well at least not for me. However, if I couldn’t be the “king of all that I could see”. To be king, well that wouldn’t be very nice. Yes, I’d like that a lot. 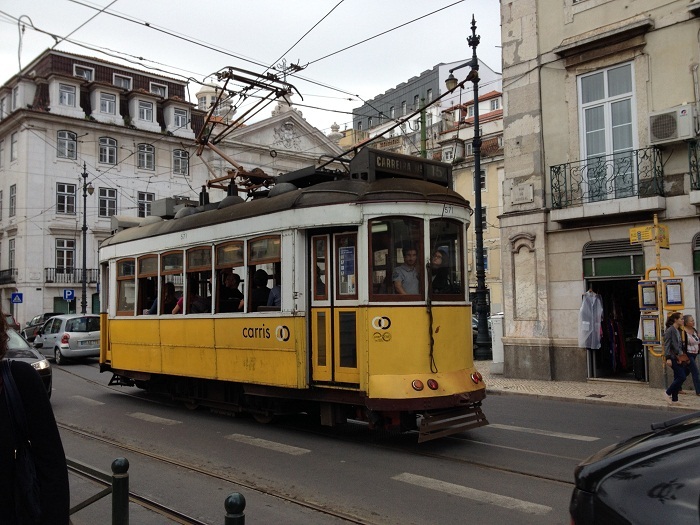 Well, it’s Monday morning and yesterday we left Lisbon to head to Sintra. We went back to the airport pick up a car and drove from there. We plan on keeping the car for much of the rest of our trip as the rental is amazingly inexpensive at less than ten Euros per day and having a car gives us a lot more flexibility. 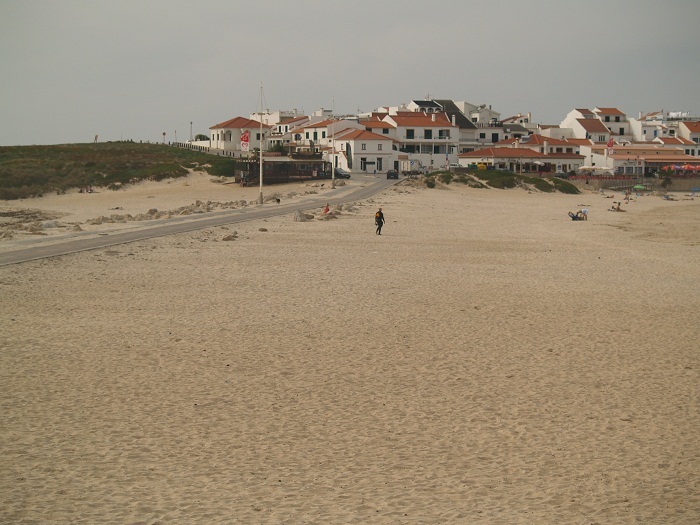 It will also be good for us as we plan on exploring some of the smaller towns along the way as we head north to Porto near the boarder with Spain. Saturday we did a lot of walking, a great deal more than planned, in large part, because I got us really lost as it was getting dark. Brenda loved that little bonus, let me tell you. We were both plenty sweaty after that debacle. “This way, I’m sure it is, you know, down the hill. No wait, it’s back that way. Hello, can you speak English? WHERE ARE WE?” Where’s Google Maps when you need them? Funny how the streets look different when it’s dark. 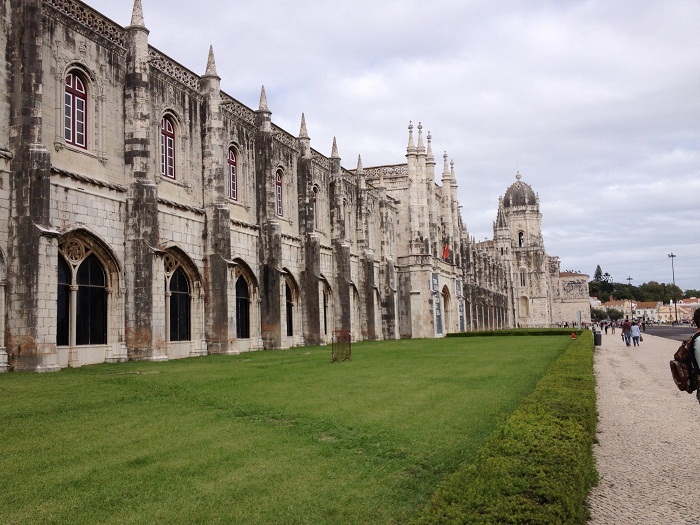 During the day we explored the waterfront area of Lisbon, where a lot of museums are located. 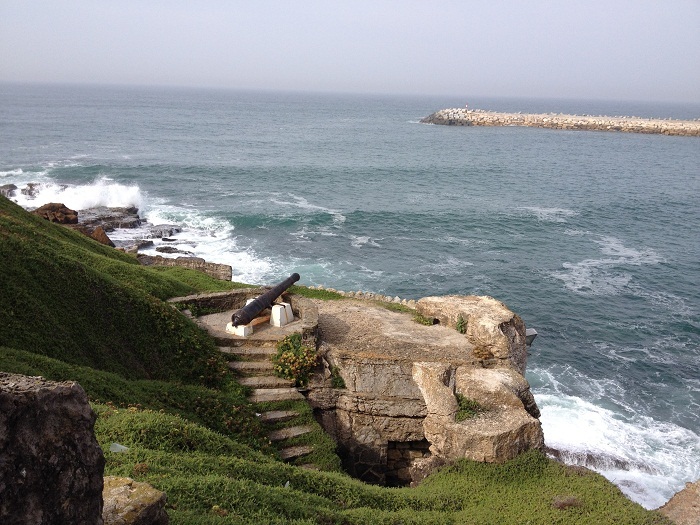 So as to not completely exhaust ourselves, we decided to focus on just a single one, that and another 18,000 steps, the Museu de Marinha, recognized as one of the finest maritime museums in all of Europe. I have to say that I agree with this statement, even if I haven’t been to many of them. 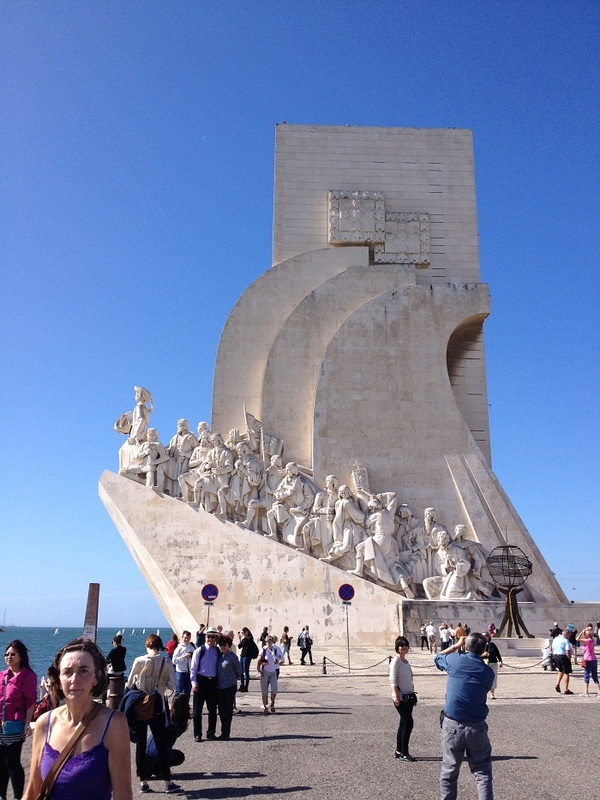 The displays told the story of the maritime history of Portugal. What a terrific collection. 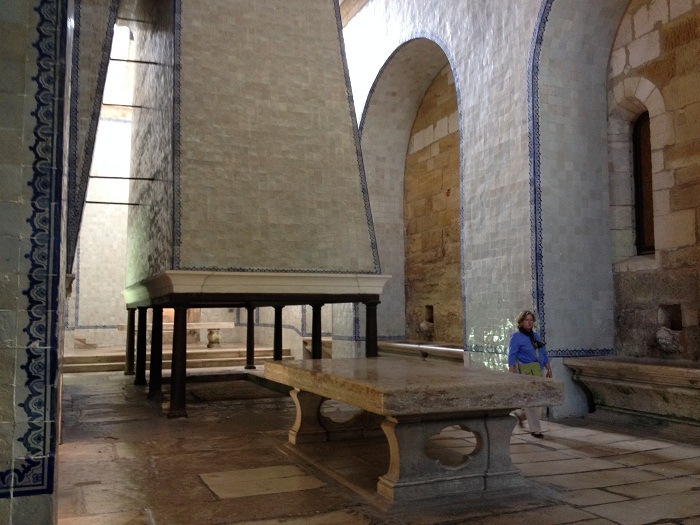 The museum is housed in an old monastery. And let me tell you, this place must have been the home to a LOT of monks. It is a HUGE building and the museum didn’t take up nearly half of it. 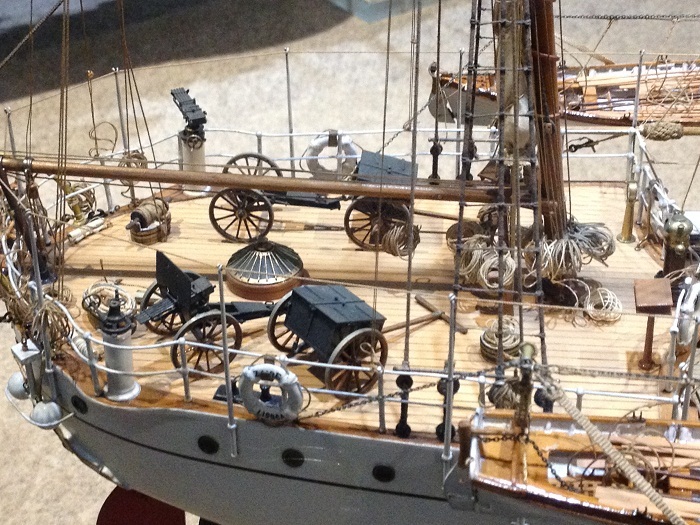 The story of Portugal’s nautical history is told through a seemingly endless collection of scale models, many of which I understand were built by the staff of the museum. 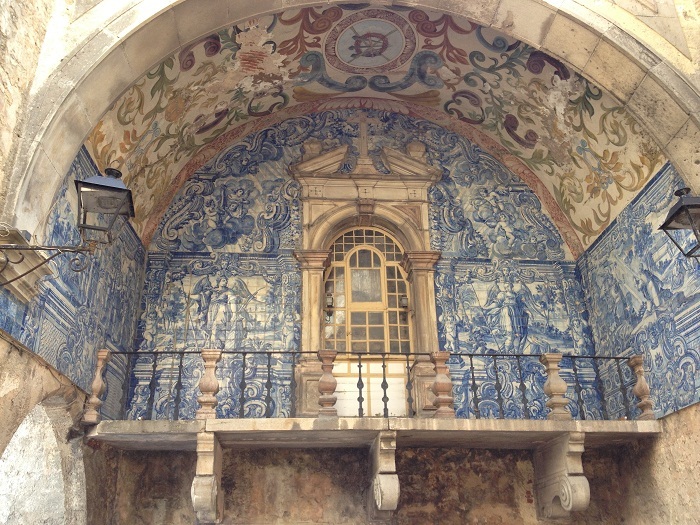 I guess that tile work isn’t the only thing that Portuguese do well. 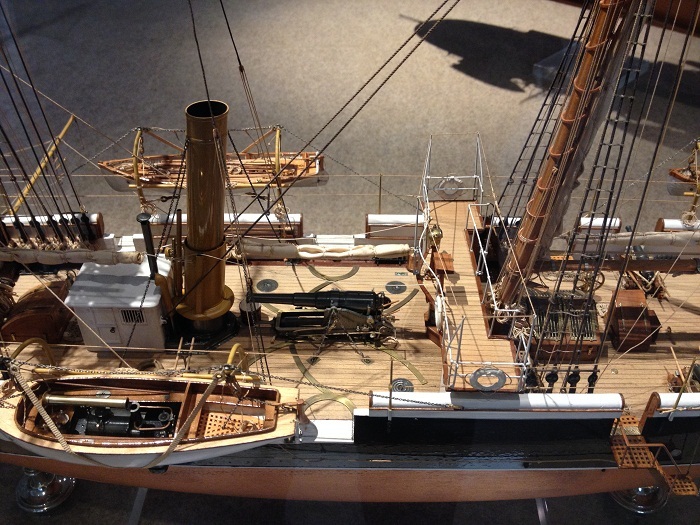 They were constructed in exquisite detail and many were quite large, up to 8′ in length. I took a lot of photos but most of them didn’t turn out that well as the rooms were not brightly lit. However, here are a few examples. 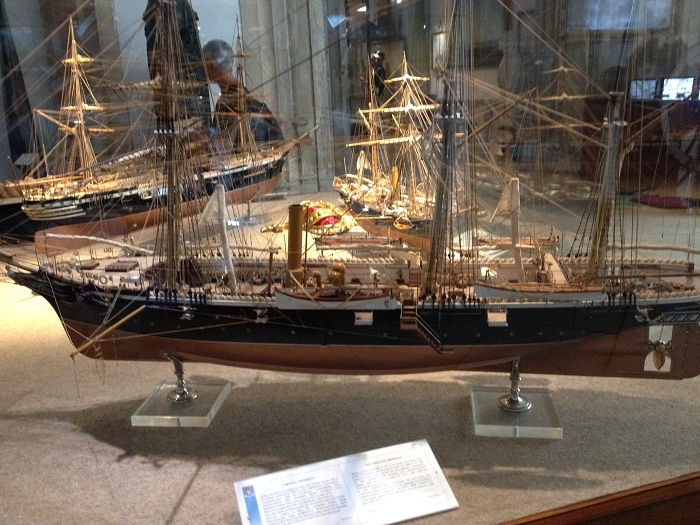 There were dozens of glass cases packed with ship models. The detail on this one, like most, was amazing. The detail, down to the smallest gun was amazing. 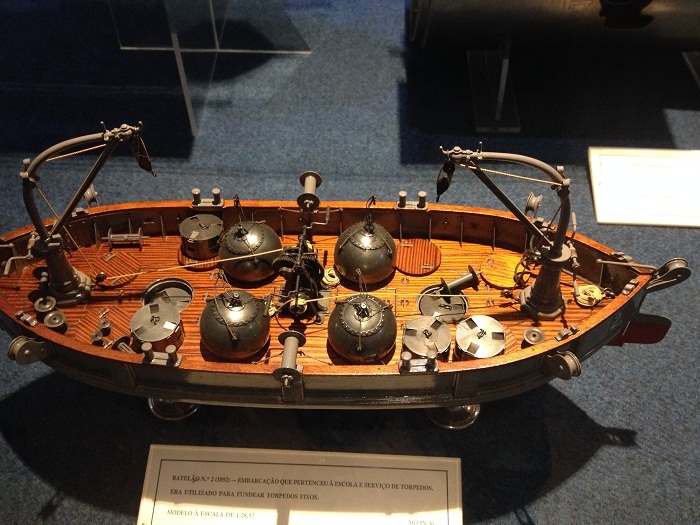 I really liked this little model of a boat for laying mines. 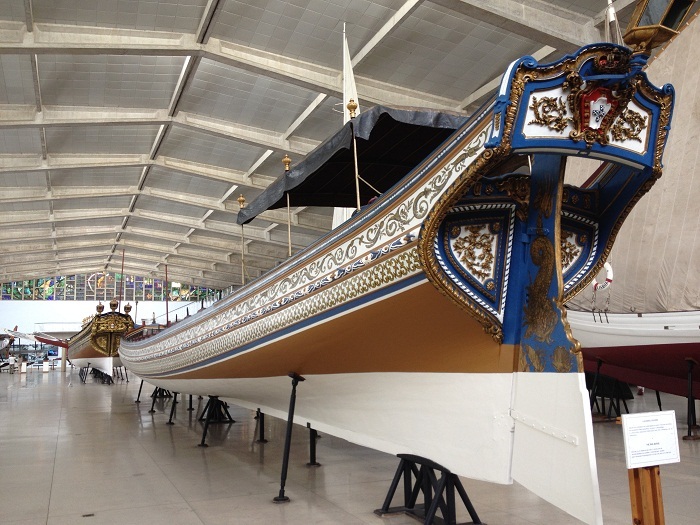 There was also a room just packed with full size and beautifully preserved classic craft and royal barges. The “queen” of the fleet had it’s last official visitor when Queen Elizabeth II visited, I think in the 50s. And, the staff was nice enough to put most of the explanations in both Potuguese and English. How thoughtful. With 80 rowers heaven help the one that got out of sync. What a mess. Off with his head!!! 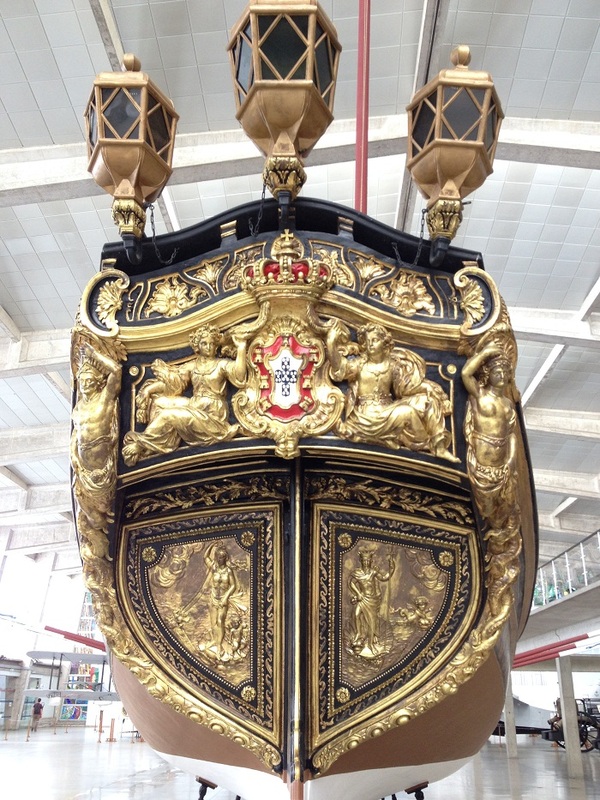 How about this ornate stern? Too bad that the queen wouldn’t have been able to see this while she toured about. While not good enough for QE II, this is quite a gig as well. Perhaps for a minor prince. 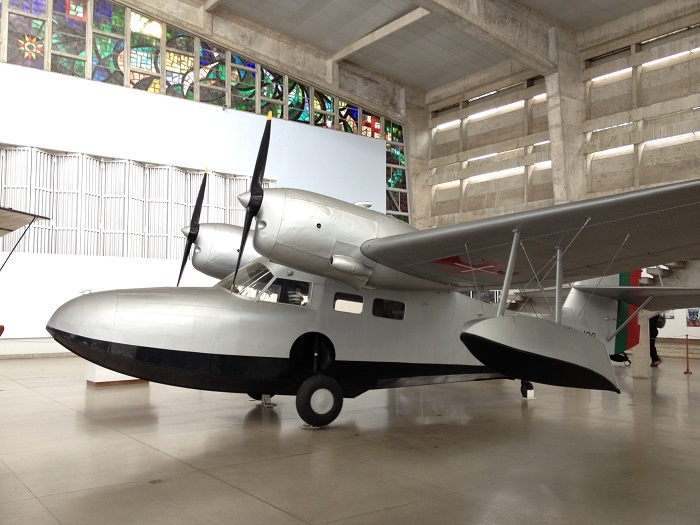 Hmm… There are also a number of early amphibious aircraft on display. This is a particularly lovely Grumman. 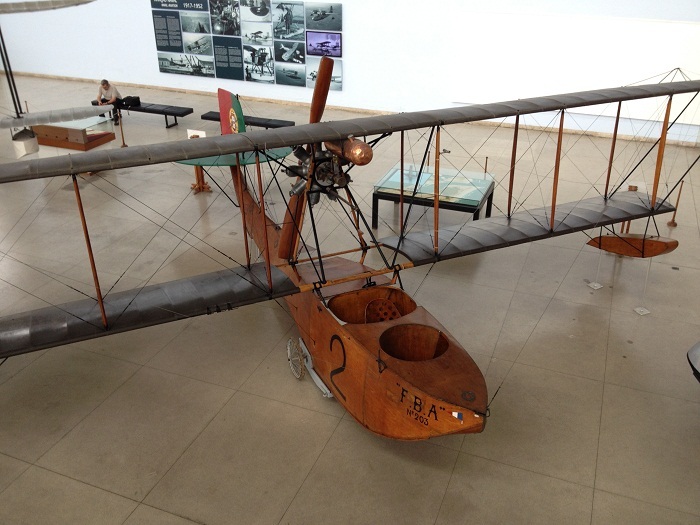 This wooden amphibian was built in 1917. It’s hard to believe that it was less than 100 years ago. Imagine what things will look like in another 100. If Al Gore is right, we’ll have lots more amphibious craft to get around. Late afternoon we stopped at a lovely cafe for an “adult beverage”. What a spot. There are great cafes all over. Looks very “European” doesn’t it? Wait, we are in Europe. 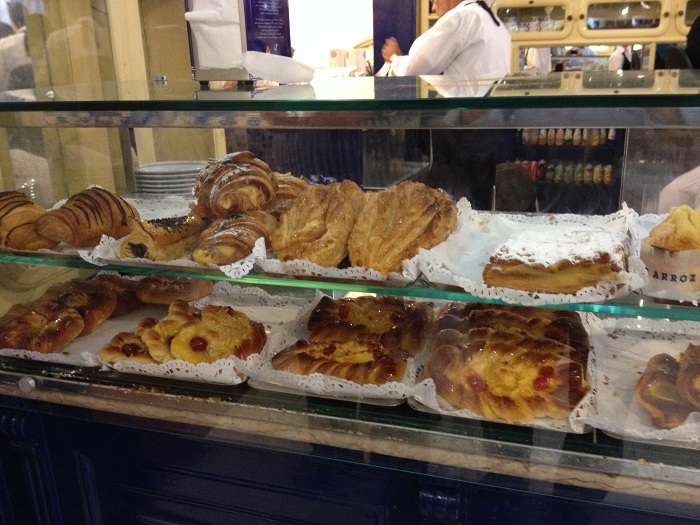 The locals are not subject to pastry shortages, or are we. Us visitors do have to keep up our strength. Seeing the trolleys rumble past just completed the moment. 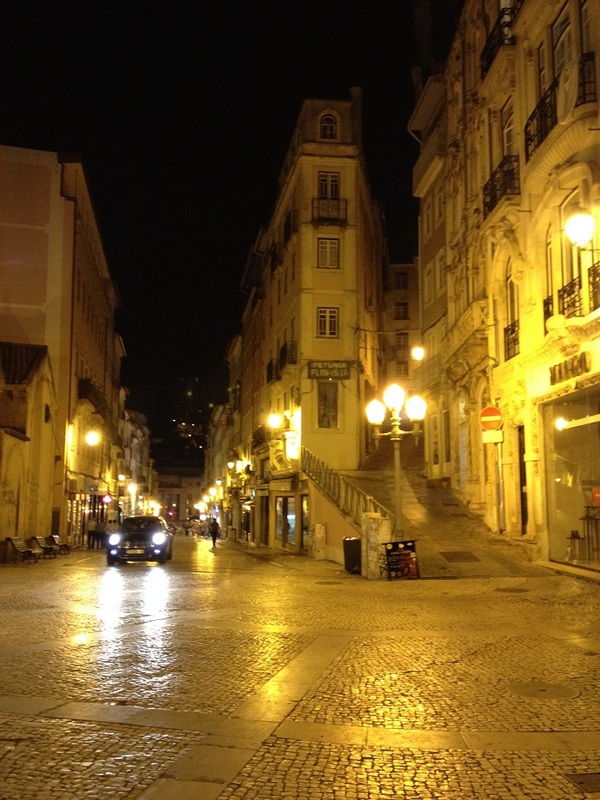 There are an amazing number of sights to see in Lisbon. Bummer that we couldn’t spend our entire month there. So many monuments so the golden age of exploration. How about this jutting out into the harbor. Really big…And impressive. It must be frustrating to have gone from the “age of exploration” to the “age of austerity”. 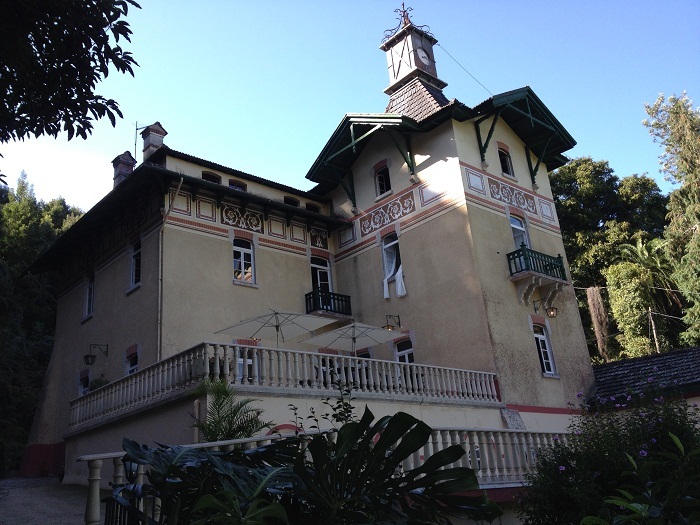 Well, it’s taken two days to get this post down as the internet access isn’t so great here in the 19th century chateau where we are staying in Sintra. I’ll just have to promise you a treat when I post about this magnificent spot. 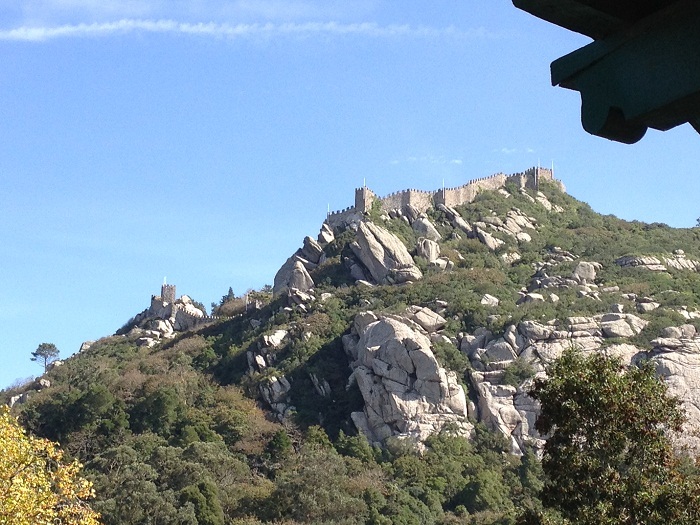 Where else can you look out of your window and see a huge castle looming on the mountain top just outside?